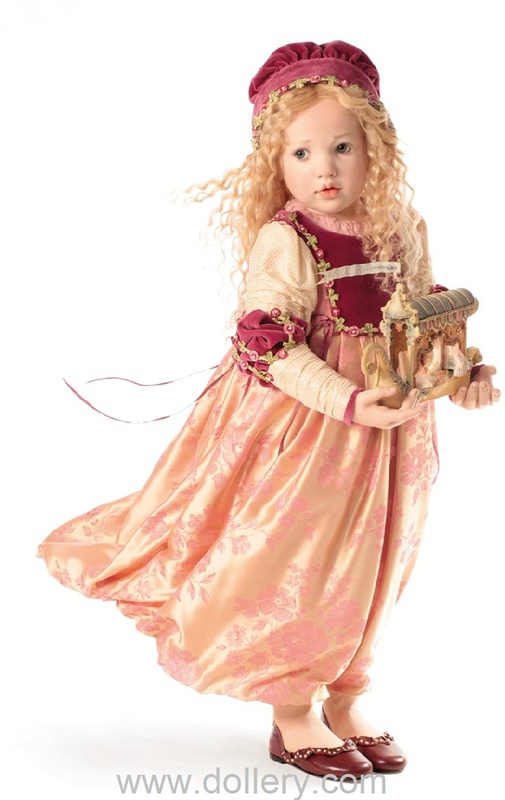 2019 update: We have been carrying Hildegard's gorgeous dolls for over 25 years and this year she has just sadly announced her "Farewell collection". This is the last year she will manufacture her dolls. She will continue on as an artist she says but most likely we assume that means on a one of a kind basis. If you have been wishing for one of her dolls, now is the time to finally get one. We offer extended layaway options and promotions. 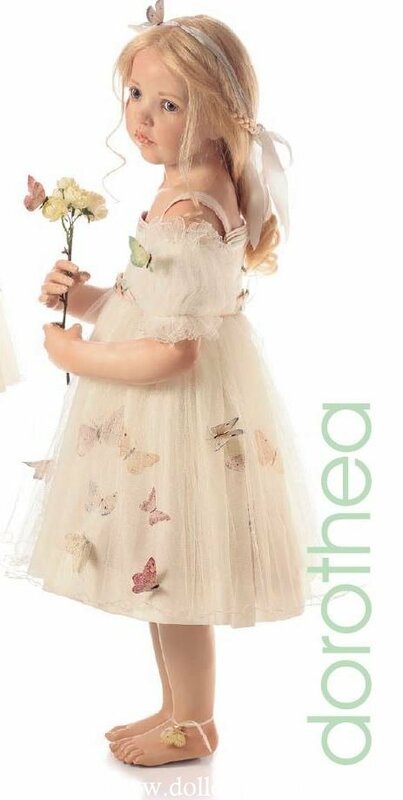 Please contact kmalone@dollery.com asap on the new 2019 line or if there are any others in previous lines that you are interested in so we can check on availability. 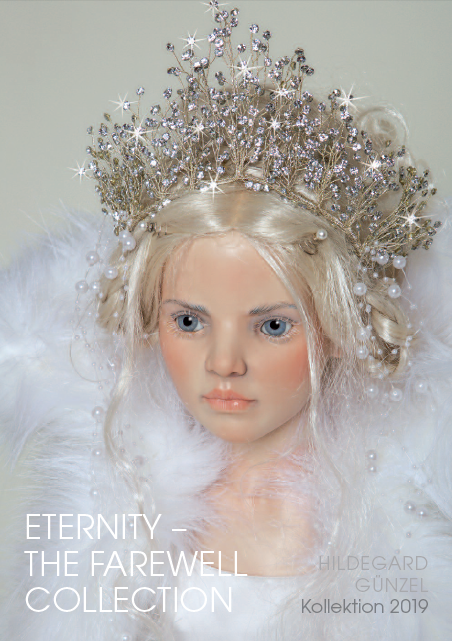 The link below is the FULL CATALOGUE including the wax/porcelains and the resin dolls. We are sure they will sell out quickly this year because of the "farewell" nature of the line. They are gorgeous! 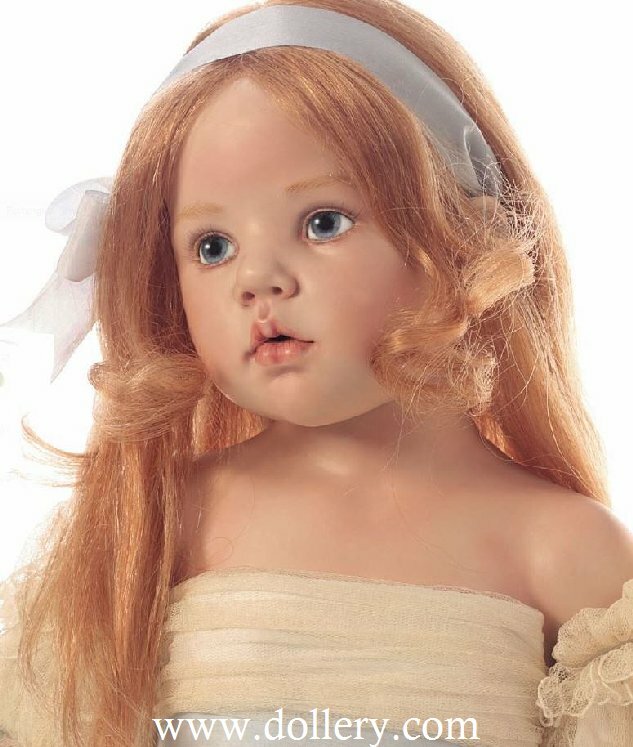 This German artist has been making dolls in wax over porcelain in small limited editions for over 25 years. We have been proud to represent her work for well over twenty five years. Hildegard came to one of earliest doll shows when she was still creating one of a kind work in wax over porcelain. Her work is in museums throughout the world and she is a master of her profession sure to be known for hundreds of years as a world famous original artist. These are her original small limited edition dolls created in Germany. Hildegard also offers an affordable resin line on a seperate link. We also carry a large collection of her secondary market work from the early 90's into current years. Be sure to click below to view those on our 2nd market gallery page. Contact kmalone@dollery.com for immediate info. You can also call 781-248-2464 or 781-447-6677 for further details. 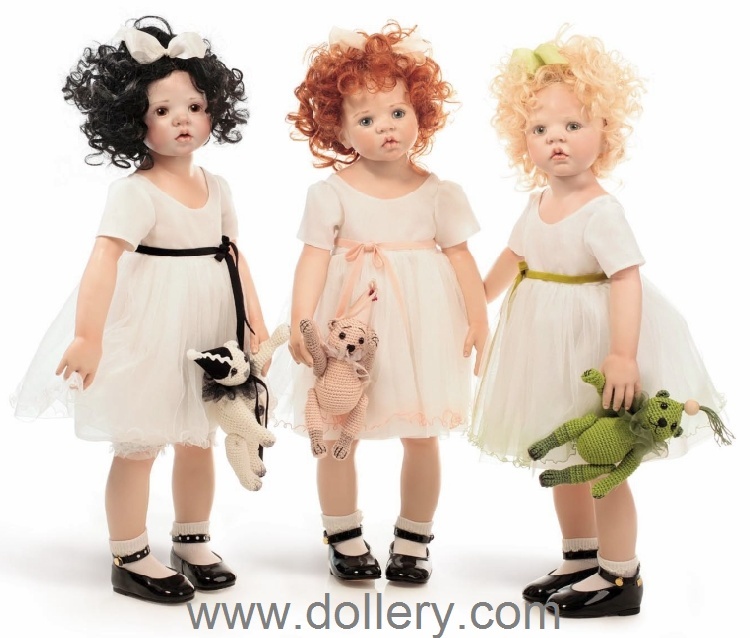 Want Gunzel dolls in resin at more affordable pricing? Click here to go to our Gunzel Resin page ! 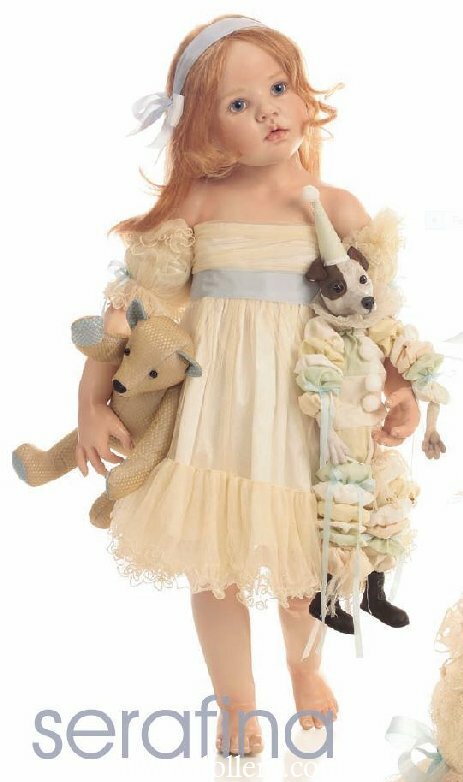 GUNZEL HAS JUST ANNOUNCED HER "FAREWELL COLLECTION FOR 2019" - HERE IS THE LINK TO THE FULL CATALOGUE - this is the LAST YEAR - Gunzel will be manufacturing her dolls. She will still continue as an artist but most likely with ooak work. Click here now to view the new 2019 Hildegard Gunzel Farewell Collection Catalogue! 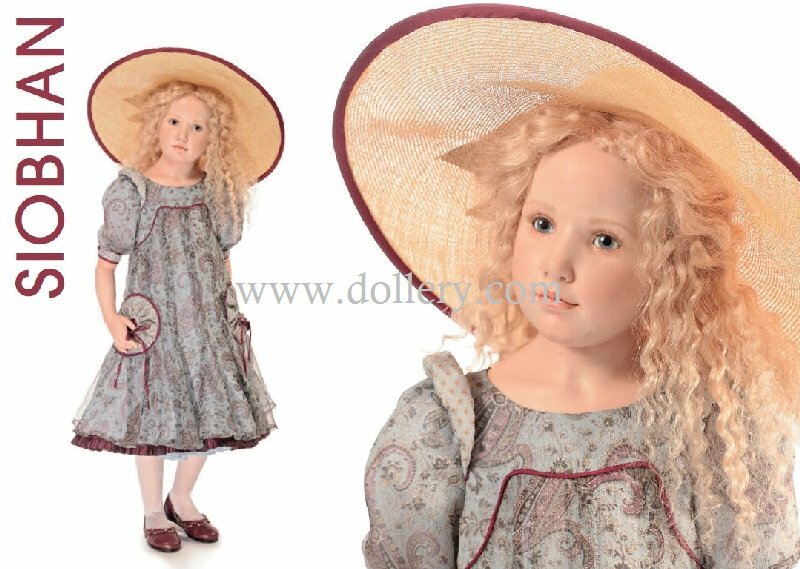 2018 GUNZEL DOLLS - SOME OF THE DOLLS IN THE CATALOGUE ARE STILL AVAILABLE SO CONTACT KMALONE@DOLLERY.COM ASAP FOR AVAILABILITY ON THIS YEAR OR PREVIOUS LINES. 2018- The brand new line is now up with all the details! DO NOT MISS THESE DOLLS! This year the editions are very small all under 10 for wax over porcelains and limited to just 80 worldwide for the resins. They will sell out early. 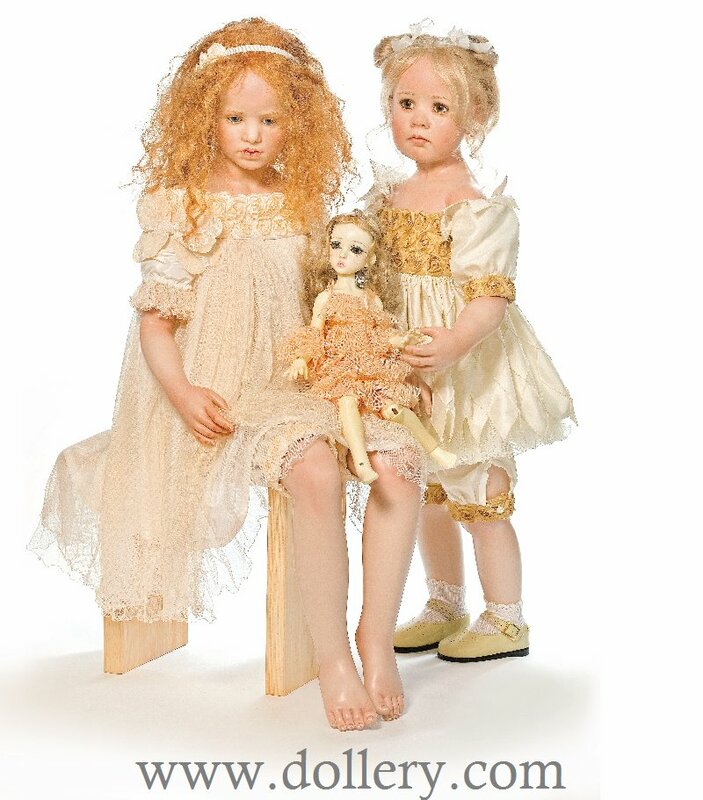 The dolls are in the .pdf file catalogue shown here! We will be updating our site in the next week with the photos but click here now to view them and be sure to contact us asap to put a deposit down on the new work before it is sold out! Extended layaway available! Click here now to view the new 2018 Hildegard Gunzel line here now! 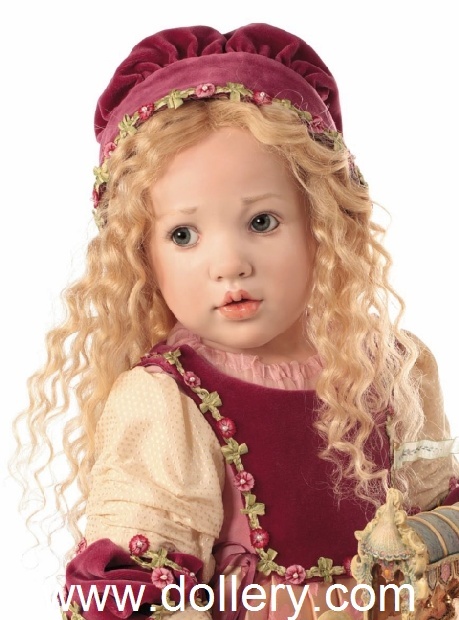 Porcelain, Size: 98 cm/38.5”, Brown and blonde wavy wig. Brown eyes. Dress made from French silk taffeta with puff sleeves and belt made from silk brocade. Underskirt with tulle ruffles. Patent-leather boots. 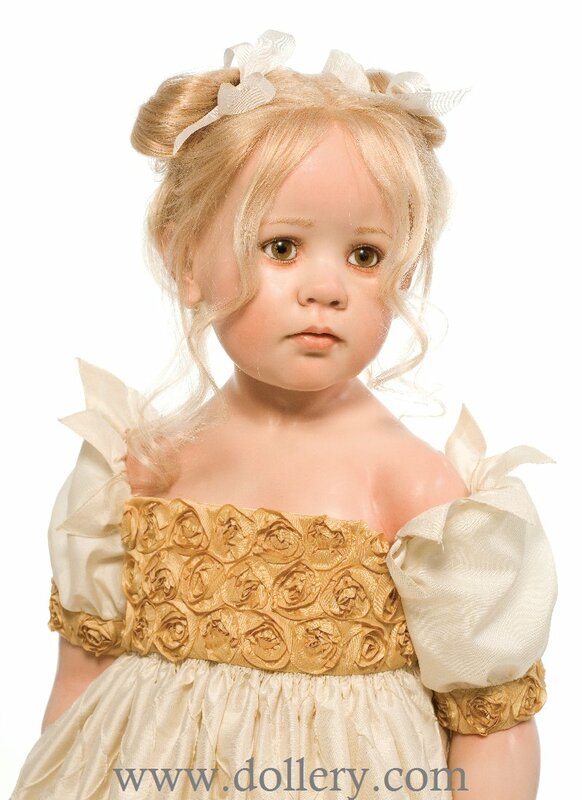 Porcelain, LE/10, Size: 84 cm / 33”, Blonde hair, in two high side buns. Light brown eyes. Elegant silk taffeta dress with diamond pattern. Embellished with rose trim. Leather shoes. 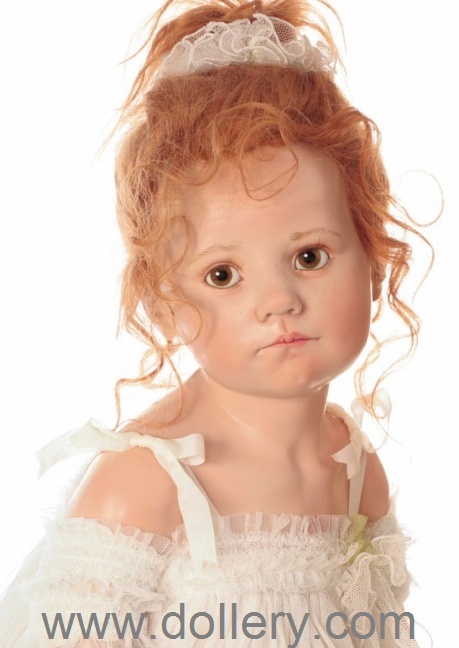 Porcelain, LE/10, Sitting size: 57 cm/22.5”, Wavy, reddish blonde hair. Bright blue eyes. Refined dress made from fine silk and silk tulle, embellished with a rose trim. Porcelain, LE/10, Size: 98 cm / 38,5”, Blonde wig with a hint of red. Blue grey eyes. Dirndl dress consisting of velvet waistcoat, silk taffeta blouse with embroidery lace, skirt made from embroidered French silk taffeta and dupioni silk. Leather shoes. 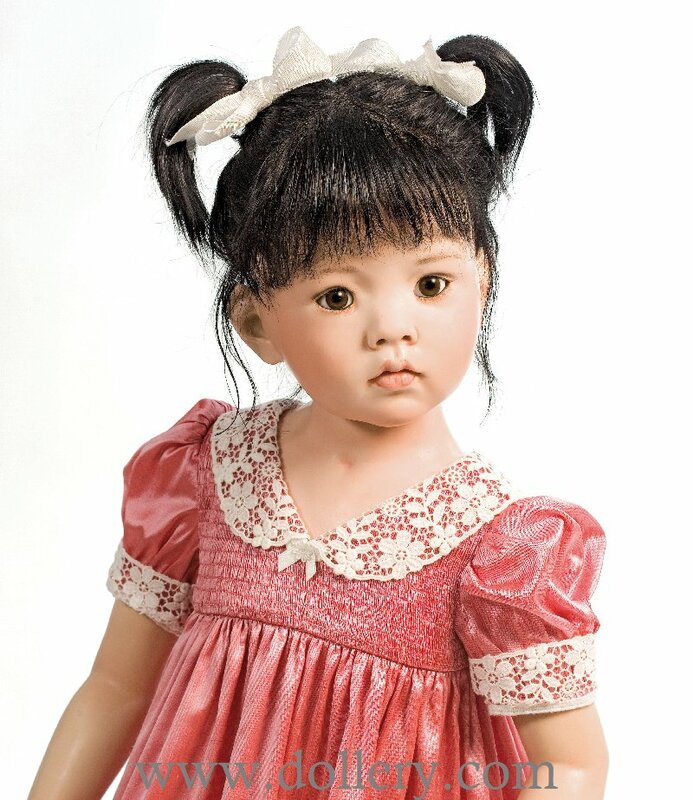 Porcelain, LE/10, Size: 81 cm / 31,5”, Black hair with small pigtails. Brown eyes. Dress made from dupioni silk with lace trims. Leather shoes. Accessory: panda bear (included with porcelain doll). 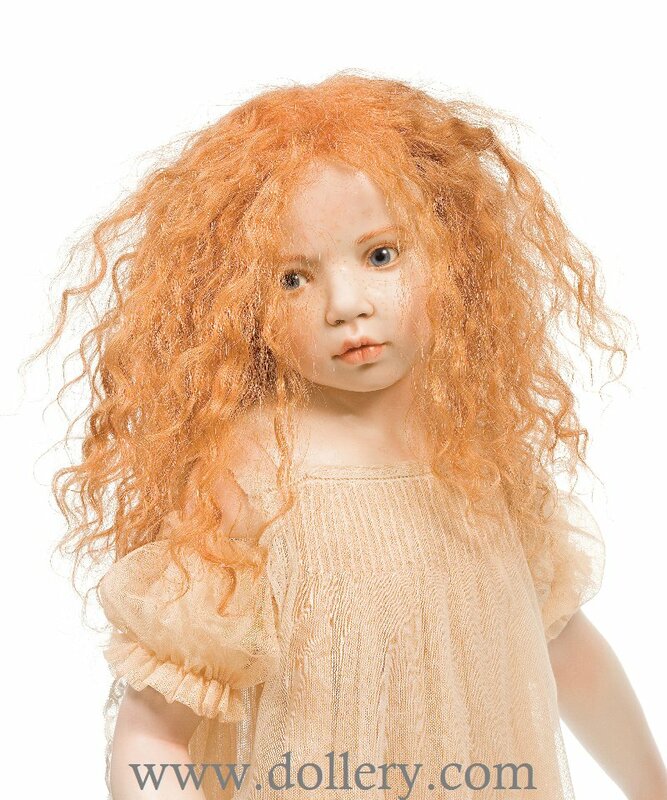 Porcelain, LE/10, Sitting size: 55 cm / 21,5”, Reddish brown, wavy wig. Light brown eyes. Delicate dress made from finest Swiss “St. Gallen” lace with underdress made from silk and tulle. Velvet ribbon and bow at the waist. 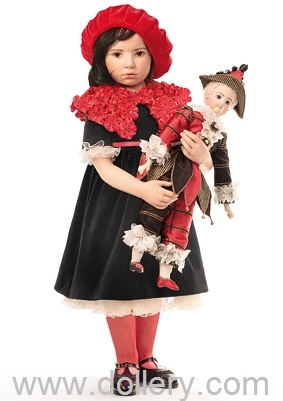 The pictured Pollichinelle doll (Ute Mareczek) can be purchased separately for $850. 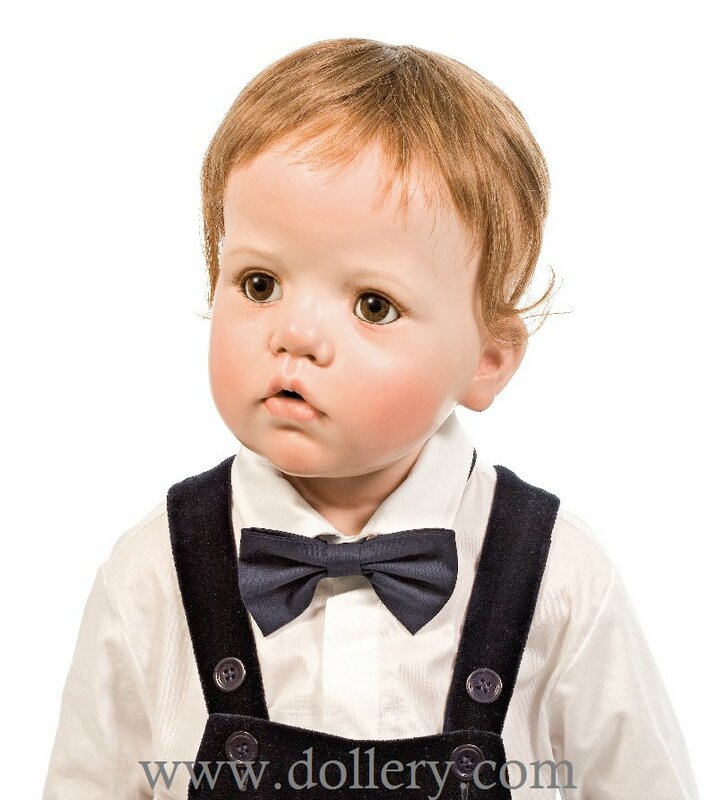 Porcelain, Size: 89 cm/35”, Brown hair, blue eyes. Refined organdy dress with silk taffeta top and added flowers. White hat, leather shoes. 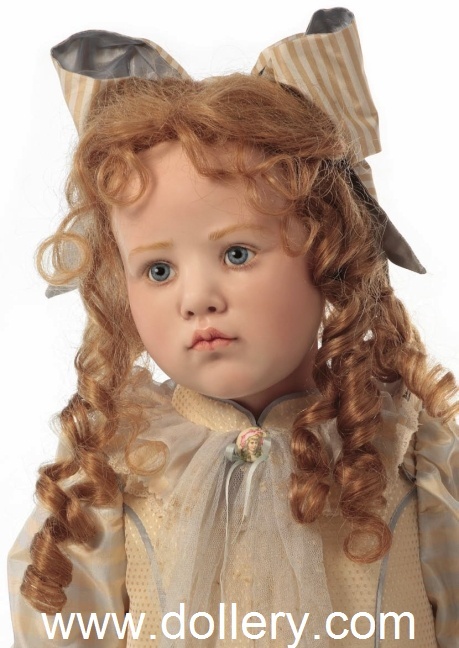 The small porcelain doll (Ute Mareczek) can be purchased separately for $1,280.00 usd. Mila is done in both Porcelain and Resin, Blonde wig with pigtails. Brown eyes. Dress made from embroidered noil silk fabric. Silk underdress with tulle ruffles. Toys on the pictures are decoration only and not included. Accessory: Mouse and ball (included with porcelain doll only). Robin is done in both Porcelain and Resin, Size: 81 cm / 31.5”, Brown wig. Brown eyes. Velvet trousers with white shirt and bow. Leather shoes. Toys on the pictures are decoration only and not included. 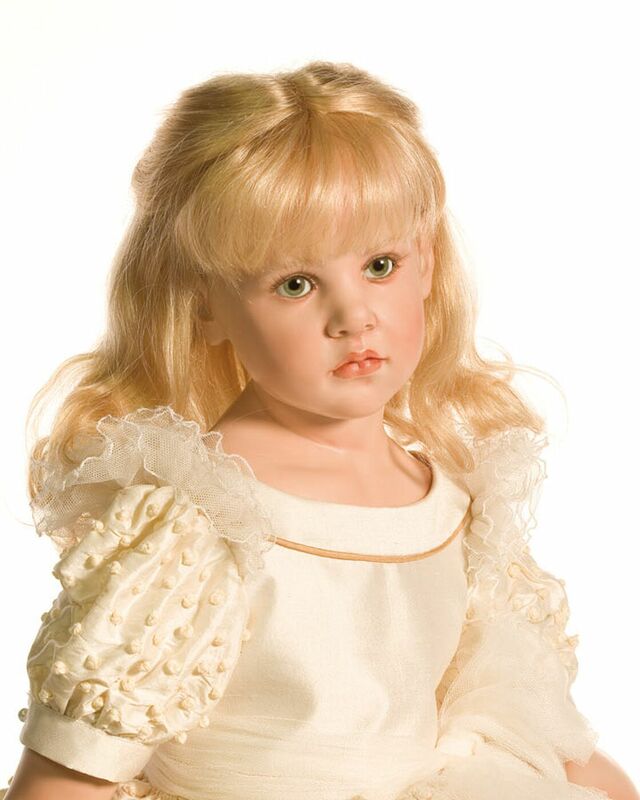 Porcelain, Size: 91 cm/35.5”, Light blonde long hair wig. Greyish green eyes. Silk dress embroidered with sequins. Bow made from French silk taffeta. Underdress with silk ruffles. Leather shoes. This may be a 1/K dress. Variations will be available. 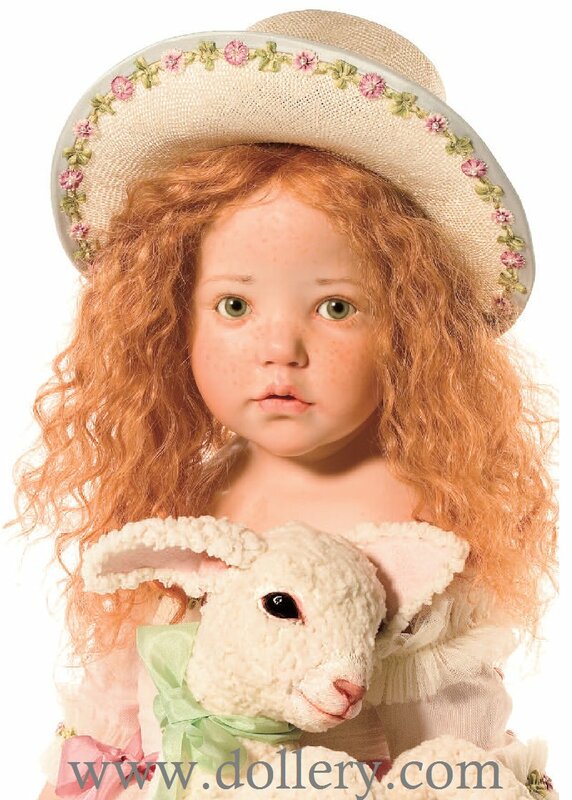 Porcelain, Size: 91 cm/35,5”, Wavy, auburn hair. Blue eyes. Dress made from vintage cotton tulle with an antique pinafore. Accessory: one fairy included. Goblin and further fairies can be purchased additionally for $800 usd and Gnome $1,280.00 usd. 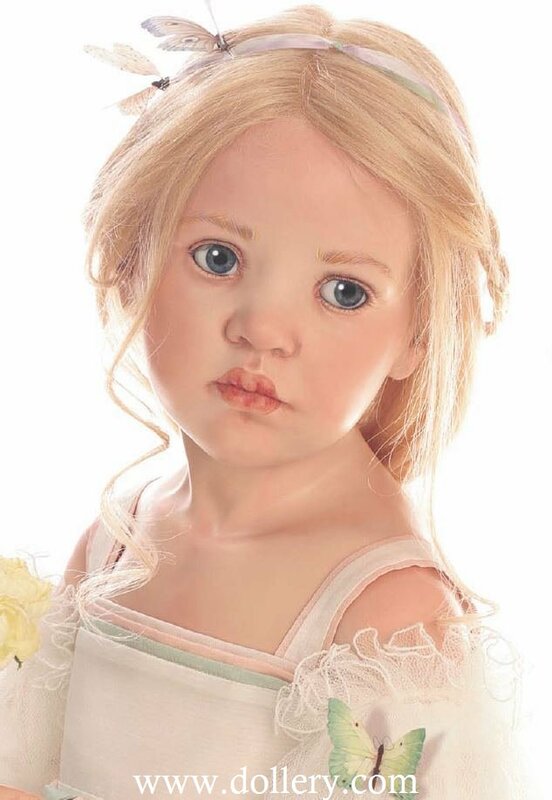 Porcelain, Size: 86 cm/33,5”, Blonde bob, greyish blue eyes. Cotton dress with millefiori print, leather shoes. Porcelain, Sitting Size: 49 cm/19”, Auburn colored wig with two plaits. Brown eyes, silk dress with flower print. Underwear with tulle ruffles. Accessory: little teddy bear (Ingrid Munzinger). OOAK but others available. 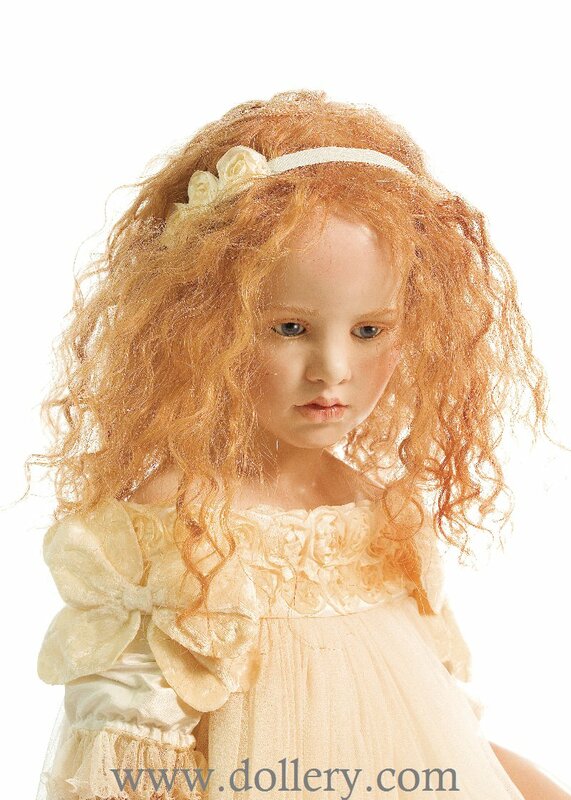 Porcelain & Resin, Size: 81 cm / 31,5”, Light brown hair. Blue eyes. Smart cotton dress with knitted bolero cardigan (cotton wool). Leather shoes. 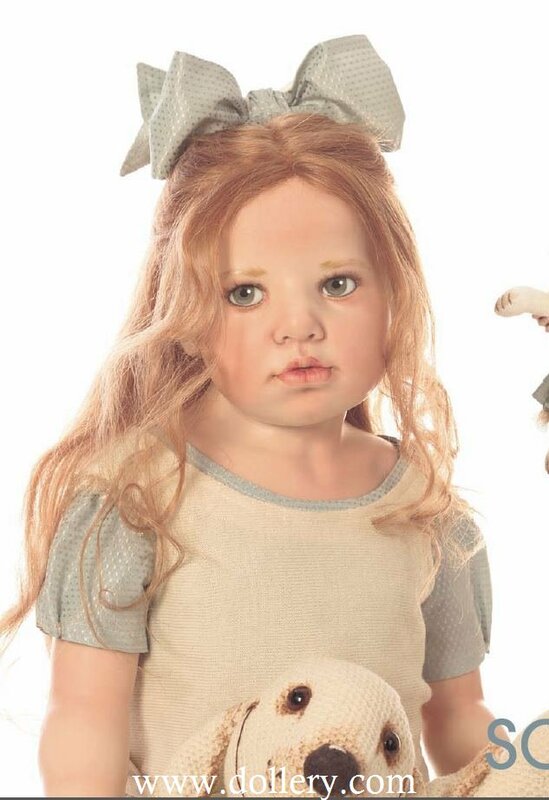 Accessory: teddy bear made from wild silk (included with porcelain doll). Fabric bear (included with resin doll). Black-brown, long human hair wig. Hand-made brown glass eyes. Ensemble consisting of a lavishly finished precious gown made of finest silk lined with appliqued butterflies. 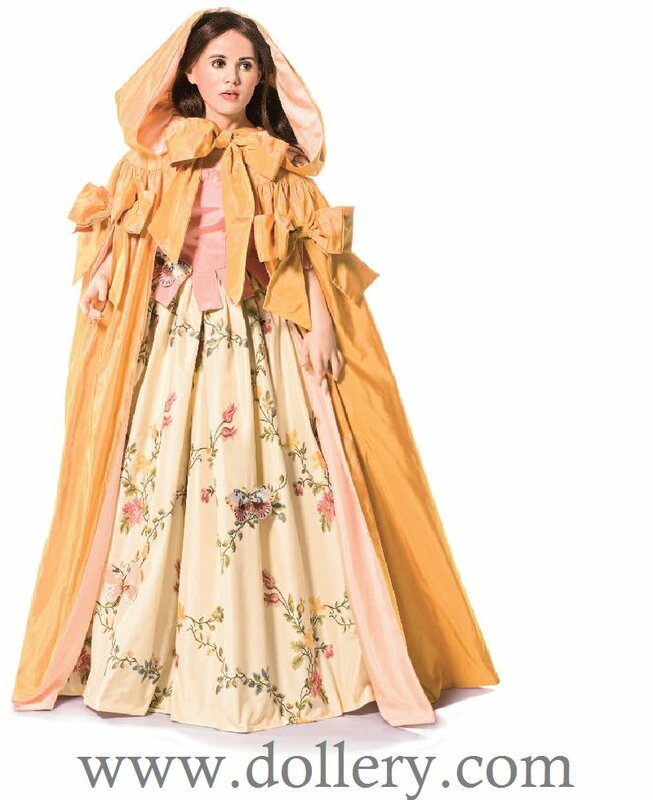 Yellow cape made of finest French silk lined with rose-coloured silk taffeta. Shoes modelled to the feet and lavishly ornamented. 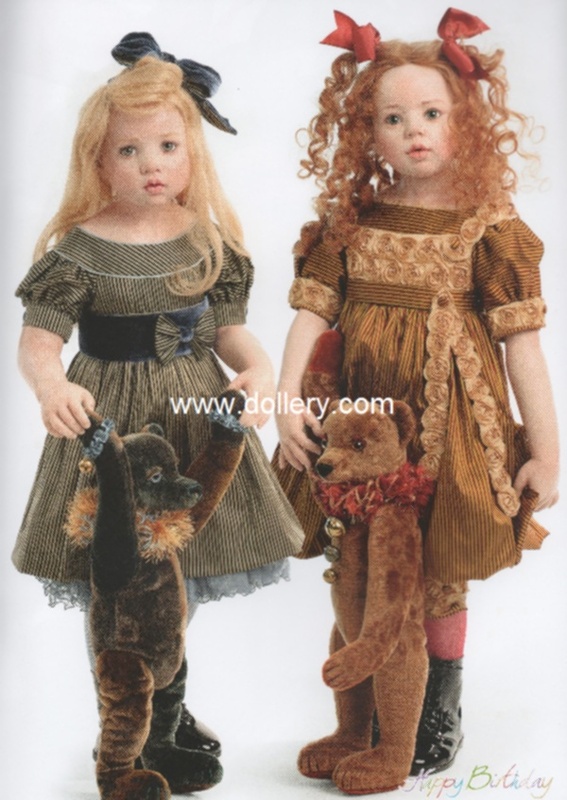 Hanna-Lena, $7,650.00 usd with small bear & $8,100.00 with both bears shown. Blonde, shoulder-length human hair wig with hair-slides. Hand-made blue glass eyes. Precious dress made of finest French silk taffeta. Skirt part of the dress covered with organza and blossoms. Silk taffeta belt and fine underwear. Leather half shoes. Accessory: Little apricot-coloured silk bear. The bigger grey-blue bear in the picture may also be purchased. (Design: Ingrid Munzinger). 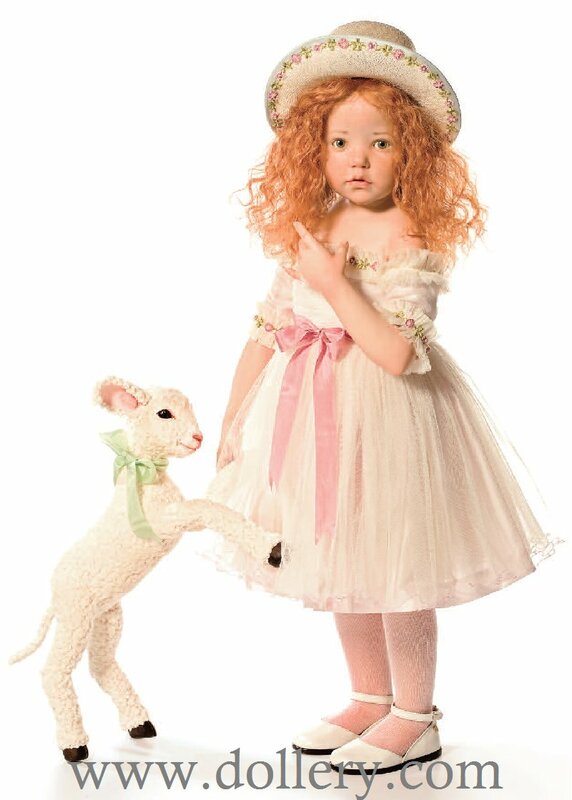 Matilda (Maite), $7,850.00 usd no sheep. $8,800.00 usd with sheep. Reddish blonde, wavy human hair wig. Hand-made green glass eyes. Silk tulle dress with blossom ribbon trim. Undergarment made of pastel Habotai silk. Silk bow on the waist. Fine underwear. Bonnet. Leather half shoes. The sheep in the picture may also be purchased (Design: Christine Green). 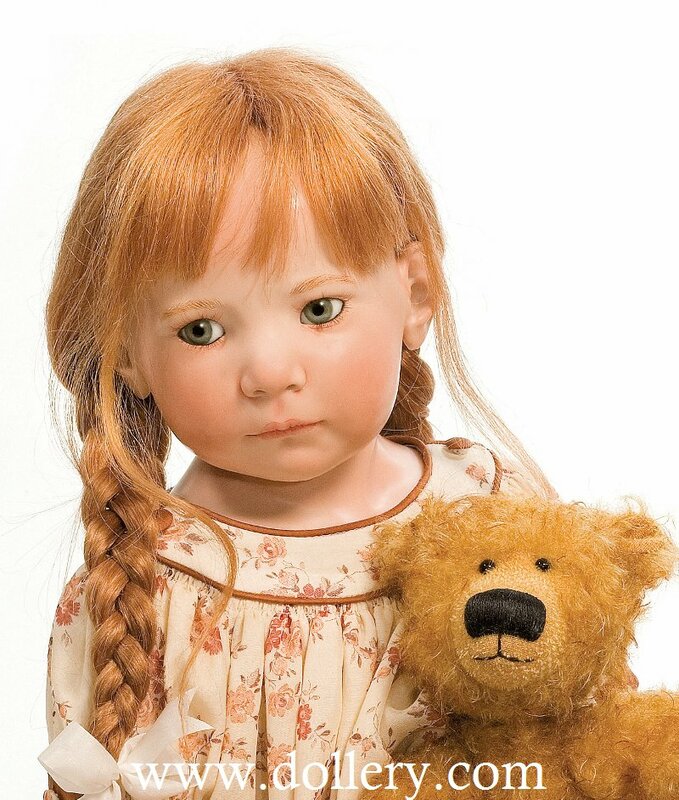 Nona, $7,650.00 usd with bear. Blonde, curly human hair wig. Hand-made blue glass eyes. Fine silk georgette dress with lavish pastel smocked inserts at chest and sleeves. Undergarment with silk tulle frills. Fine underwear. Leather boots. Large hat. Accessory: Little white teddy bear (Design: Ingrid Munzinger). 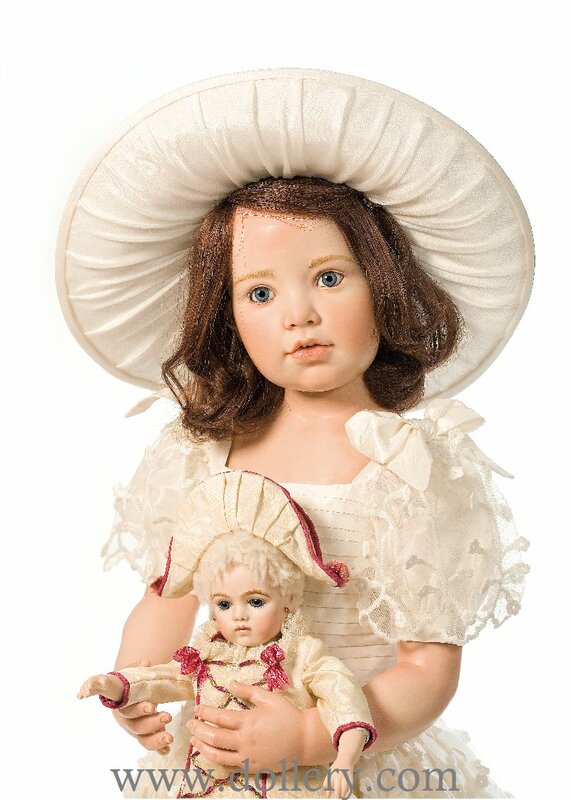 Pearl (sitting) $7,650.00 usd no dolly. $8,600.00 usd with dolly. Reddish blonde, shoulder-length wavy human hair wig. Hand-made grey-green glass eyes. Precious dress made of embroidered natural silk. Silk bow at the waist. Underskirt with silk tulle frills. Fine underwear. Large hat. Accessory: White Spitz dog (only available once). 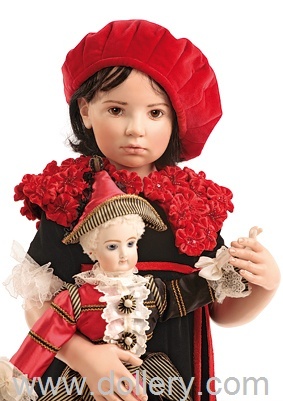 The little porcelain doll in the picture sitting on her lap (an antique reproduction) may also be purchased (Design: Ute Mareczek). Blonde human hair wig. Hand-made grey-blue glass eyes. White cotton blouse, trimmed with blue seams. Woollen cardigan. Short needlecord (corduroy) trousers. Knee-length stockings. Leather shoes. Brown-blonde, shoulder-length curly human hair wig. Hand-made grey-blue glass eyes. 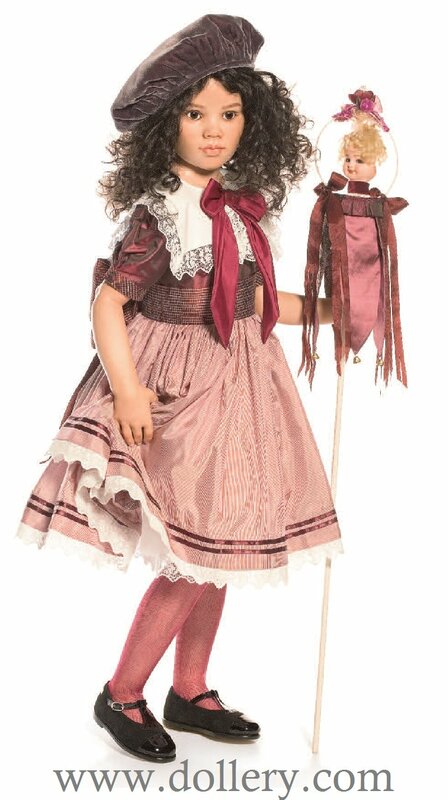 The doll in the picture is dressed in an antique tulle dress. Only one dress of this design will be available. Silk bow. Fine underwear. Leather lace-up boots. Large sun hat. Brown, shoulder-length human hair wig with adornments. Hand-made brown glass eyes. Precious dress made of finest French silk taffeta, ornamented with blossoms made of taffeta, velvet and fur pom-pom. Skirt with upper skirt made of hand-dyed silk tulle. Silk taffeta belt. Fine underwear. Hair adornment. Leather half shoes. Desiree, $7,650.00 usd no accessory. $8,900.00 with Doll Cabinet. Blonde, shoulder-length human hair wig. Hand-made green glass eyes. Precious dress made of finest, hand-embroidered French silk taffeta. Silk tulle frills and tulle bow waistband. Underskirt with tulle frills. The “doll cabinet” in the picture with “Bru doll” in the dress box may also be purchased (Design: Ute Mareczek). Candida, Porcelain $7,650 with accessory. Black-brown, curly human hair wig with cap in beret-style. Hand-made brown glass eyes. Two-color lavish silk dress with big cotton collar and silk bow. Silk sash at the waist. Fine underwear. Leather half shoes. Reddish blonde human hair wig in braids. Hair ribbon with blossom. Hand-made green glass-eyes. Fine, transparent silk blouse. 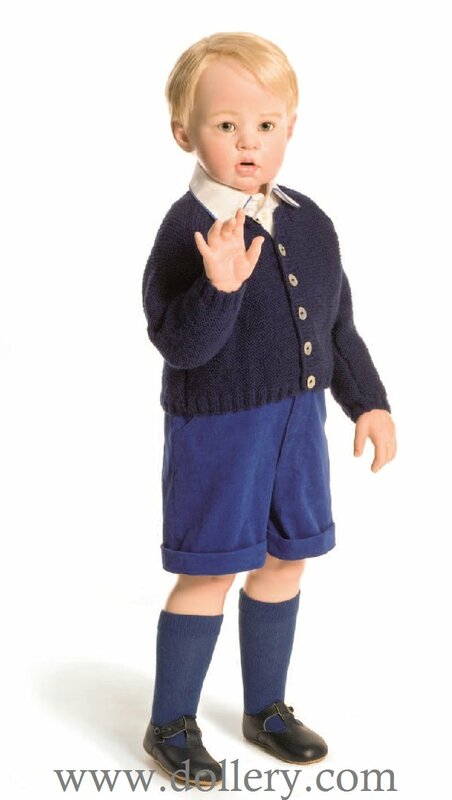 Knitted pullover and woolen waistcoat, short woolen trousers with turn-ups, long stockings and scarf. Leather lace-up boots. Blonde, shoulder-length human hair wig with adornments. Hand-made blue glass eyes. Rose-white silk dress with two silk bows at the front. Silk belt. Underskirt with tulle frills. Fine underwear. Leather sandals. 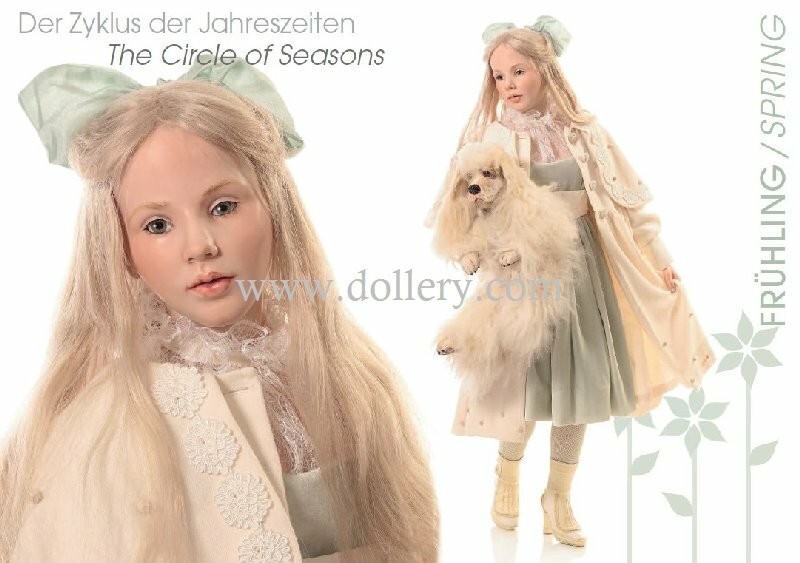 2015 Dolls - Wonderful collection! Please make sure to order now! Call 781-248-2464 today. $9,500.00. A deposit of 1/3rd down is required. Shipping does not start until the fall. Extended delivery /layaway options available. We have never seen Gunzel do an officially licensed portrait doll like this one. He is amazing! Very special piece sure to be a wonderful collector's heirloom for generations to come. 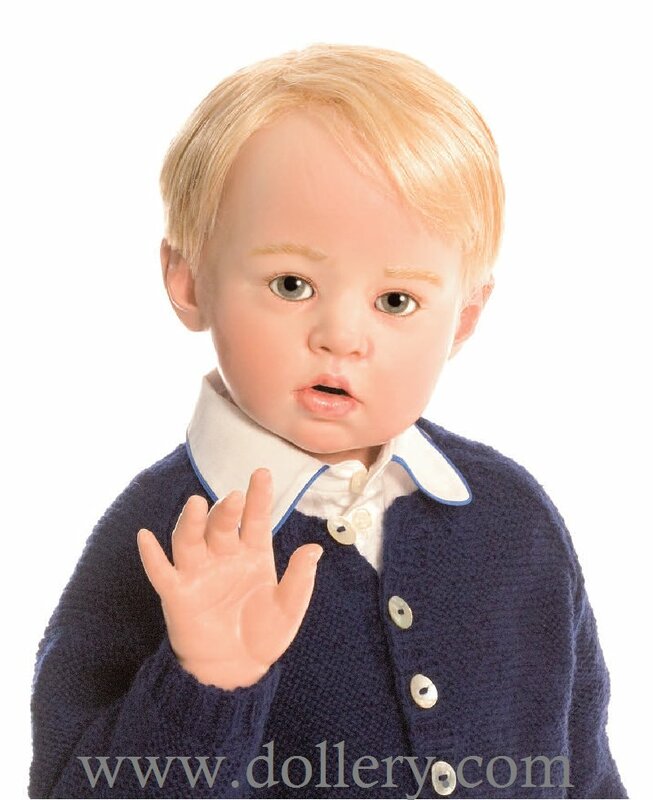 Wax over Porcelain, LE/35, 31.5" (80cm), blond human hair, German handmade glass blue eyes. To catch this moment of little Elvis, surrounded by the love of his parents, long before he became the star that would inspire the world, was a fond pleasure to Hildegard Günzel. She grew up with Elvis music, like so many of us and recalls a lot of pleasant memories from this time. For more than three decades – from the candy pink 50’s to the glittering 70’s, Elvis didn’t only excite the US audience, but also his fans in Germany. With this very special sculpture Hildegard Günzel makes it possible for the greatest Elvis fans among us to get a small glimpse of how Elvis’ mother felt, when she looked into his beautiful blue eyes, all her adoration for him apparent. The figurine ‘Elvis Presley’ is made of the finest porcelain that is glazed with a delicate wax layer. This finish gives the sculpture its tender and very life like expression. This technique created especially by Hildegard Günzel is a characteristic of Hildegard Günzel’s doll art. 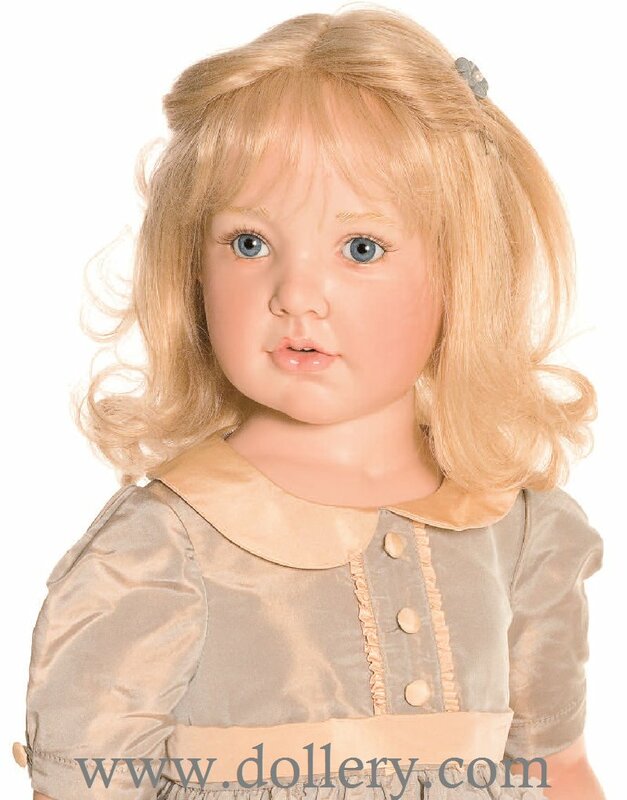 Elvis is wearing a blond real hair wig and he has handmade blue glass eyes from Lauscha/Germany. 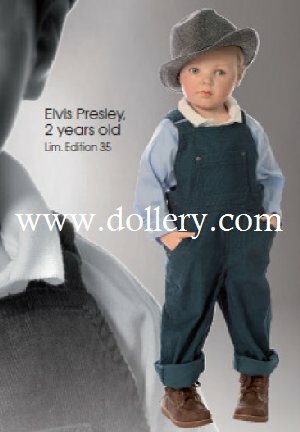 ‘Elvis Presley’ is limited to 35 dolls worldwide. He is officially licensed and a very special highlight of your collection. Of course we will also hand you a collector’s certificate for your doll. 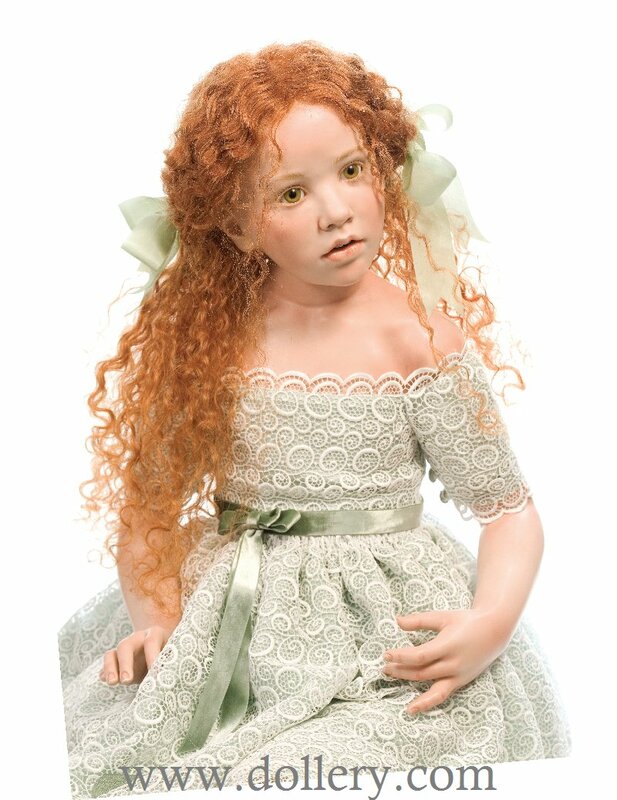 Hildegard Günzel has received more than 200 awards and honors in the past 40 years for her exquisite doll art. 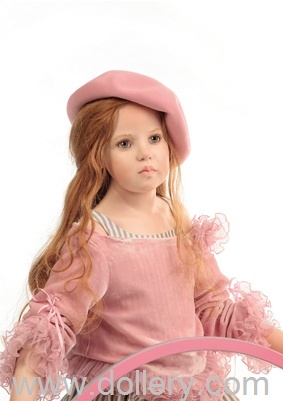 She lends her distinction to the doll art worldwide by her work. Welcome to her world that makes dreams come true and take little Elvis by his hand. As our special Gunzel collector, we would like to give you the advance opportunity to order this treasure, as we know, ‘Elvis Presley’ is not just a very dear and special collector’s item to doll collectors around the globe, but also to many Elvis fans that dream of owning this beautiful sculpture. 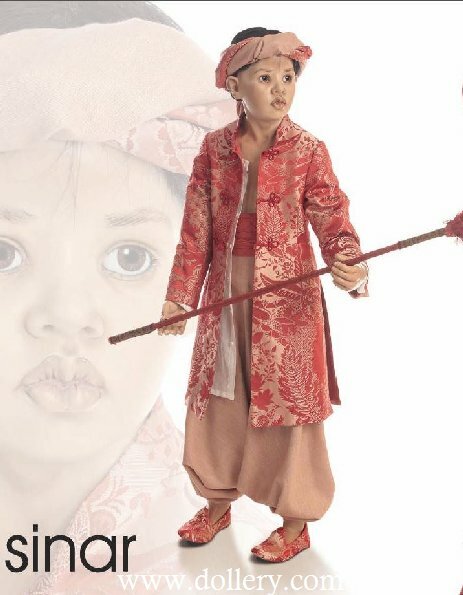 Hildegard gave it a limitation to only 35 dolls worldwide, that will make it a “must have” to many Elvis fans. 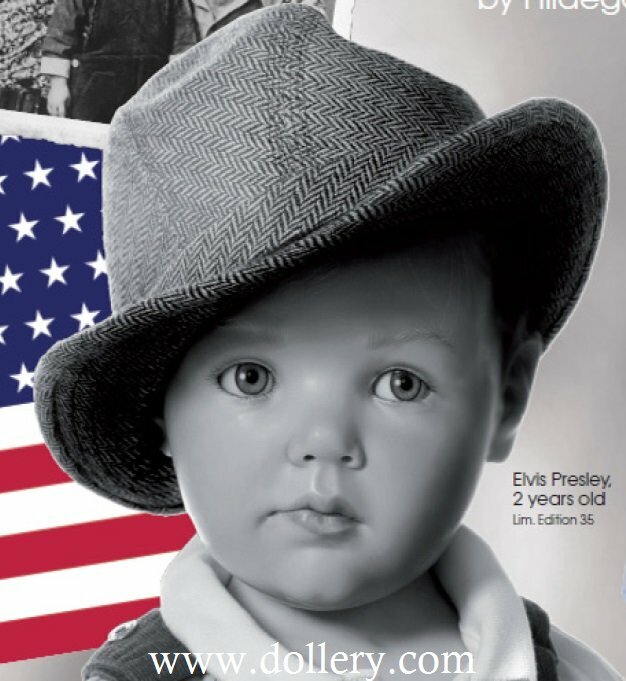 Gunzel will inform the Elvis fan clubs worldwide shortly and we are certain, this doll will sell out very quick. 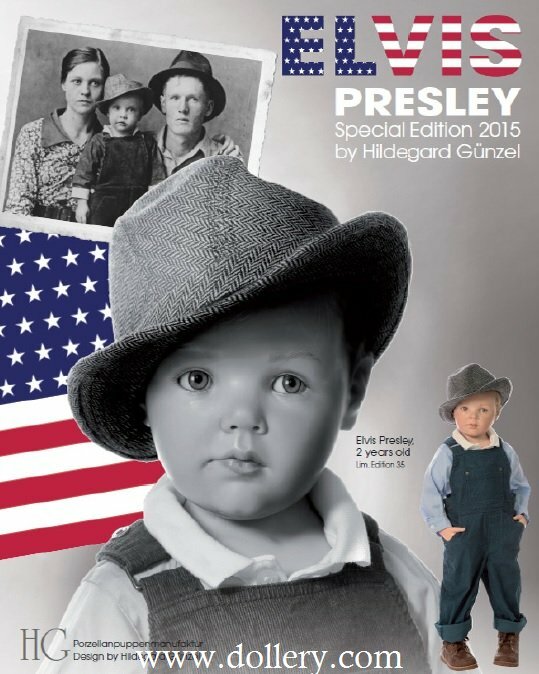 “Elvis Presley” by Hildegard Günzel is an officially licensed product with ABG EPE IP LLC. Bigger images are shown below. Each is a one of a kind and will not be repeated! Philomene has a White curly human hair wig. Handmade green glass eyes. Luxurious dress made of French silk taffeta, trimmed with hand embroidered cotton knots. Silk brocade corsage. Skirt and sleeves with rich tulle trimming. Two under-dresses made of silk with ruche valance. Addition: Hand painted violin. Antoine has a White human hair wig with braid. Handmade grey-green glass eyes. Suite ensemble made of silk jacquard trousers, silk shirt, frock made of silk brocade trimmed with lace applications and tulle. Wide and lavishing tulle frill collar. Headdress made of silk jacquard. Leather shoes. Addition: Hand painted violin. Blonde, wavy, up-do hairstyle of human hair wig, trimmed with velvet flowers on silk ribbon. Handmade fawn brown glass eyes. Silk taffeta dress with lace inlay at the top. Waist band made of silk with velvet flowers. Silk underskirt and organza valence. Matching silk pants. Addition: Bru-Doll with music box “Ute Mareczek”. Ginger brown human hair wig with braid. Handmade fawn brown glass eyes. Luxury long two-piece dress of silk taffeta. Skirt with finest silk tulle top layer. Silk taffeta top in style of a corsage with tulle trimming. Floral lace at the sleeves and multilayer silk tulle finish. Silk underskirt with valence. 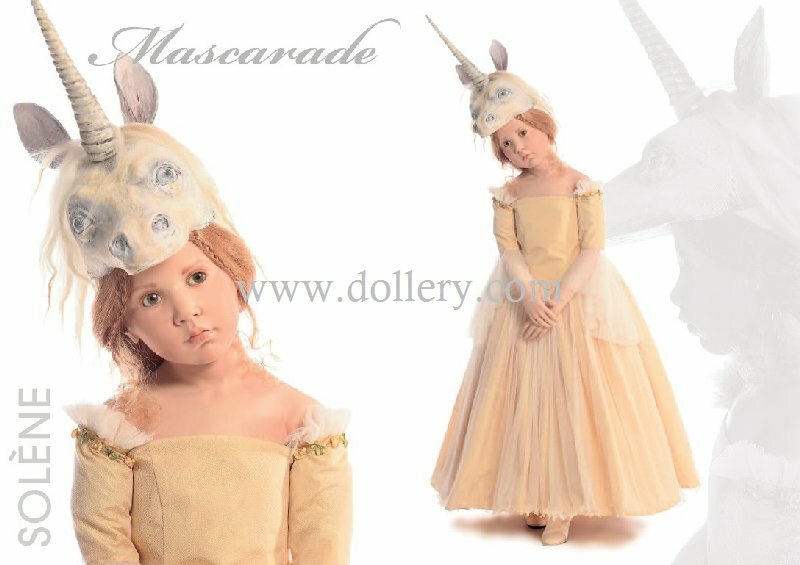 Addition: Headdress in a unicorn design by “Christine Green”. Blonde wavy human hair wig. Handmade blue glass eyes. Delicate light dress made of silk chiffon with paisley pattern and silk edging. Underskirt with colourful tulle frills. Grand sun hat with silk edging. Leather shoes. Ginger-brown human hair wig with hair ribbon. Handmade grey-blue glass eyes. Multilayer, multicolour silk- georgette dress with lavishing designed silkbrocade belt in ornament style. Pants and underskirt with tulle lace. Leather shoes with strap. or Set III: Snails 2 + 5 + 6. There are further snails available. Please ask. Dark brown, long human hair wig. Handmade brown glass eyes. Skirt made of embroidered French silk taffeta. Cashmere jumper with separate silky blouse collar and silk ribbon. Cashmere coat, hood trimmed with real fur. Leather half boots. Addition: Santa Claus “Christine Green” and Teddy Bear “Ingrid Munzinger”. Black human hair wig in bob style and floral "Alice" band. Handmade bright blue glass eyes. Silk skirt with Madeira embroidery and black multilayer tulle petticoat. Cashmere jumper with patent leather belt. Patent leathern shoes. Addition: Siamese cat with collar “Isolde von Malchus”. Medium brown human hair wig in a bob style with silk ribbons. Handmade bright blue glass eyes. Dress made of French flower-embroidered silk taffeta with a large silk taffeta ribbon. Underskirt made of Habotai silk with colored tulle frills. Leather shoes. 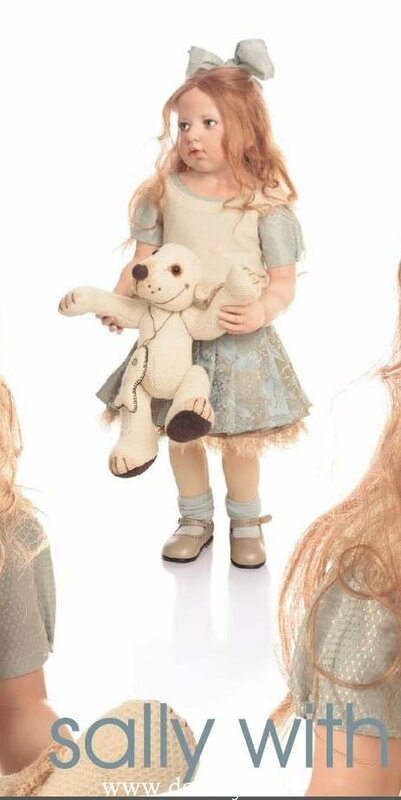 Addition: Tiny Teddy Bear with tulle dress “Isolde von Malchus”. Melisandre done in white in a Ooak theme is shown here with a Prince from another year. 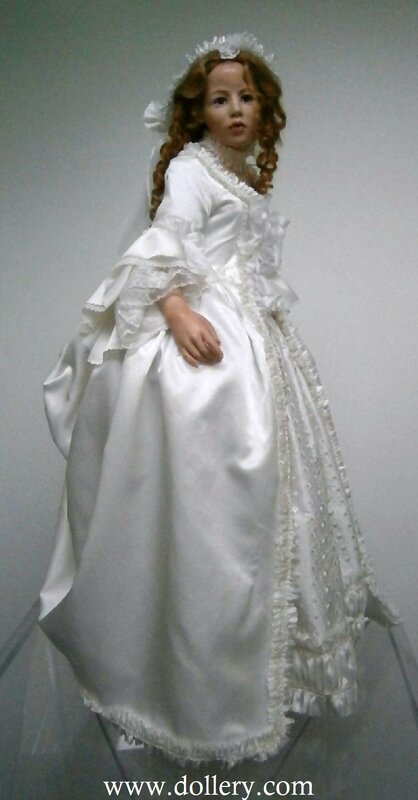 She is dressed in a one-of-a-kind white dress. Email Kim at kmalone@dollery.com for more information. "Melisandre" in white ooak costuming. According to the Gunzel catalog it is their intention to provide the fabrics shown in the photographs but they can be affected by the availability of materials and suppliers. While their policy is to make every effort to keep changes to a minimum, they reserve the right to vary, at their own discretion, colours, fabrics, trimming and design of accessories without prior notice. Limited Edition of 15 worldwide. 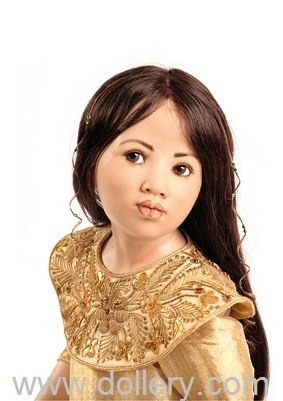 Doll is made of wax over porcelain. 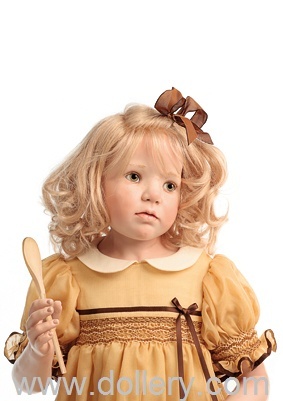 Mouth-blown hazel brown glass eyes, white human hair wig, sumptuously elaborated with pearls. Sumptuous ensemble made of silk-duchesse and silk-tulle-fringe decorated with silk ribbon bows. Silk-tulle skirt. Crinoline with handmade silk-ribbon bows. Duchesse pants with silk-tulle fringes. She comes with a white flying dragon on a stick by Christine Green. Doll is made of wax over porcelain. Mouth-blown glass grey-green glass eyes. Blond medium-long curly human hair wig. cotton velvet cap with rose border. Dress made of silk-brocade and silk jacquard inserts of cotton-velvet, rose-border. Underskirt and underpants made of cotton dodder, antique cotton-lace border. Leather shoes. She comes with a tiny doll by Christine Green. Doll is made of wax over porcelain. Mouth-blown grey-brown glass eyes. Long light brown, flecked with blond human hair wig in curls with lace hood. Multi-layer skirt made of wild and natural silk with corsage-top of finest goat-suede. Silk Georgette blouse. 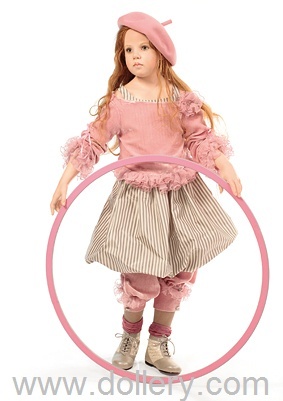 Under-dress with woolen fringes, cotton underpants with laces. Comes with 2 doves by Christine Green, wooden bowl and wooden stool. It does not come with sand and seeds shown in picture. Museum Edition, Limited to 5, 37.5" (96cm) standing. Doll is made of wax over porcelain. Mouth-blown brown glass eyes, hazel-brown human hair wig in a braid, decorated with pearls and veil. Necklace of black glass pearls. Sumptuous, ponderous robe, according to Renaissance model with a cotton velvet dress with insert of finest French silk-brocade and trimmings. Cotton-velvet cloak, trimmed with velvet and silk-ribbon, Doupioni-silk lining. Cotton underpants with laces. Velvet slippers. She comes with an Alpaca Ermine by Vera Racke. 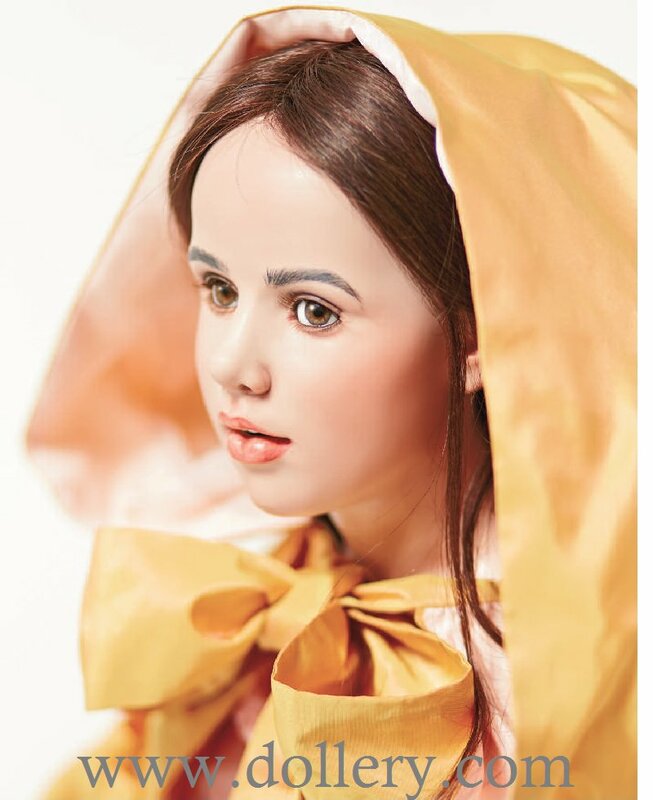 Doll is made of wax over porcelain. Mouth-blown grey-blue glass eyes. Blond human hair wig. Fine silk-taffeta dress with flower-embroidered skirt. Underskirt made of Habotei-silk with tulle trimming. Leather shoes with straps. 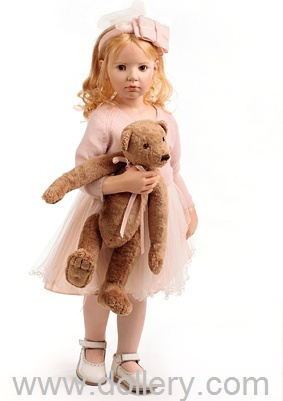 She comes with 2 silk mohair teddy bears by Ingrid Munzinger. Doll is made of wax over porcelain. Mouth-blown grey-brown glass eyes. Long brown human hair wig. Sumptuous silk-organza dress, silk lining. Skirt of folded silk-organza, decorated with more than 100 organza rosettes. Silk-taffeta underpants. Suede leather shoes decorated with leather rosettes. 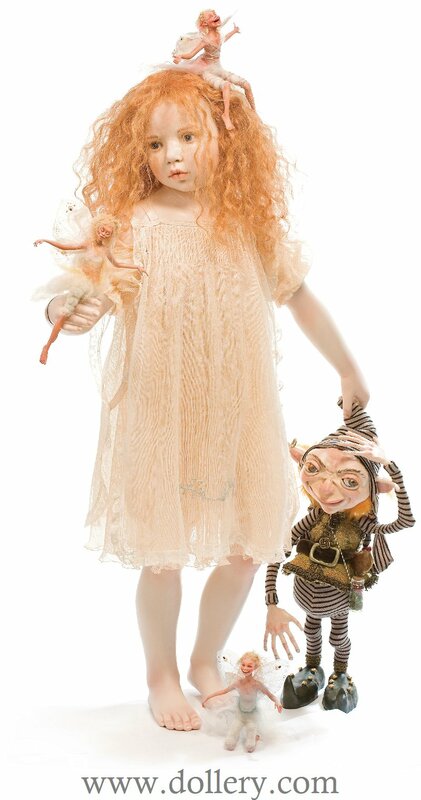 She comes with a Little Elf by Christine Green. 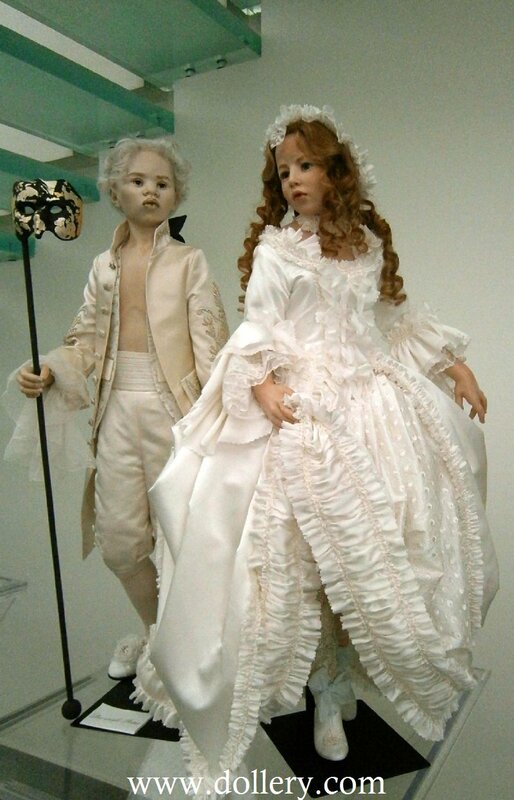 Dolls are made of wax over porcelain. Each wears a white Habotai-silk dress with fine silk-tulle, and a color coordinated seam. Velvet-ribbon in matching colour of black, peach or light green. Black leather shoes with strap. 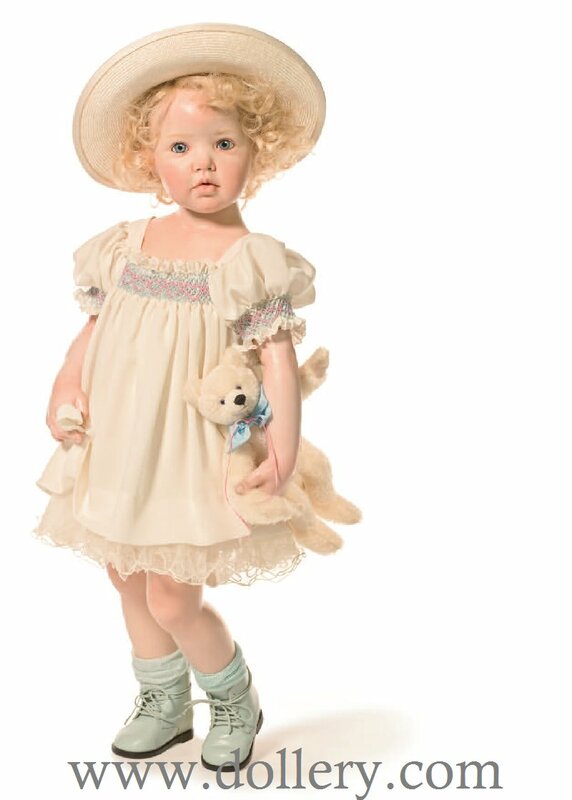 Comes with a Hand-crocheted teddy bear in white, peach or light green by Vera Racke. 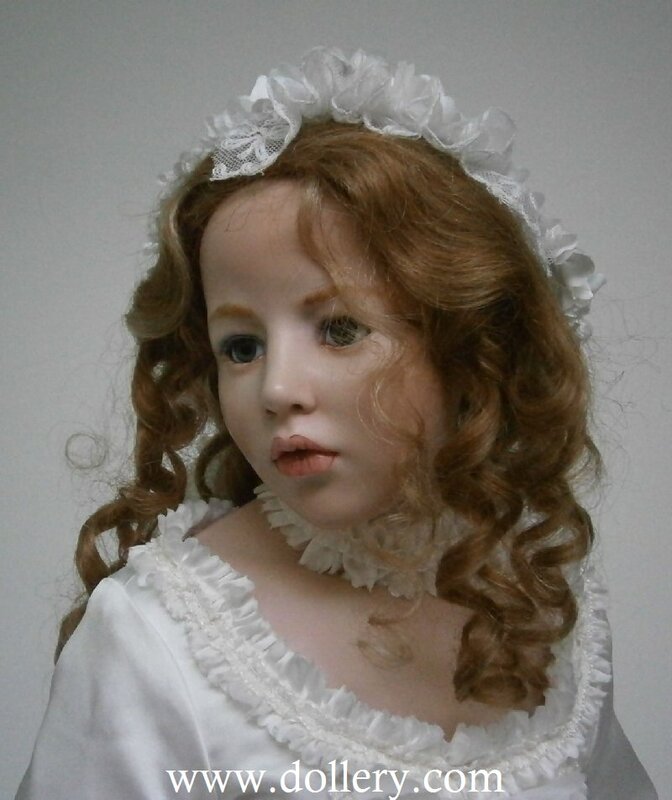 Variation #1 has black curly human hair wig with white silk hair ribbon. Mouth-blown light brown glass eyes. 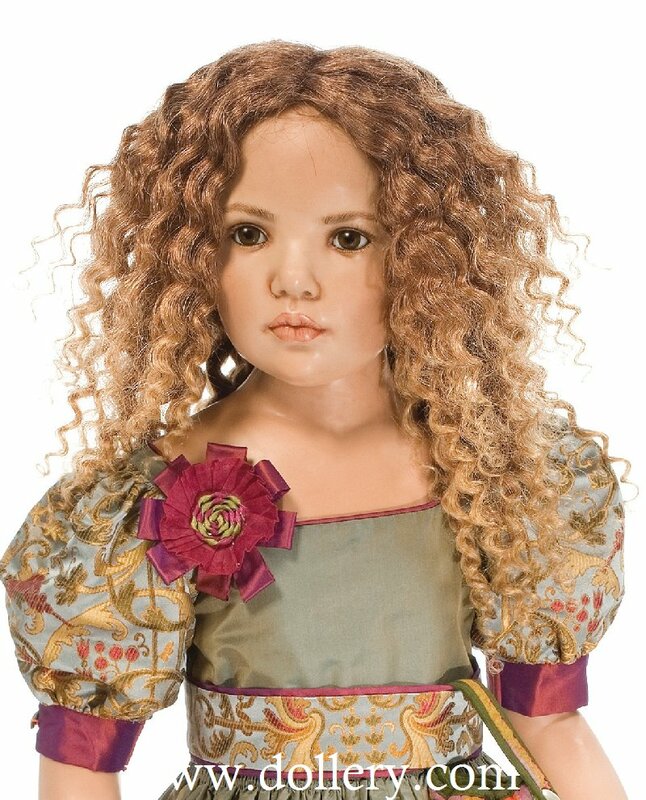 Variation #2 has Auburn curly human hair wig with peach silk hair ribbon. Mouth blown dark blue glass eyes. 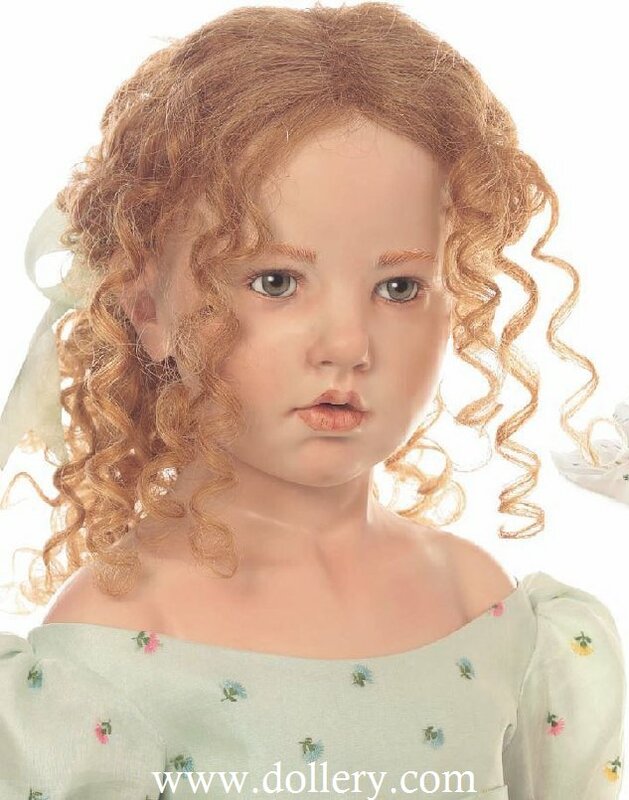 Variation #3 has blond curly human hair wig with light green silk hair ribbon. Mouth blown grey-green glass eyes. 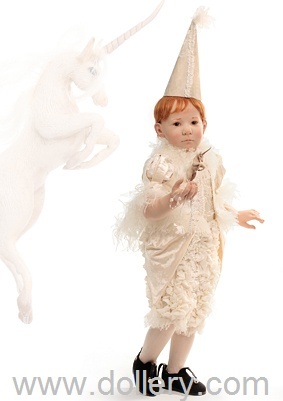 Doll is made of wax over porcelain. Mouth-blown brown glass eyes. Strawberry blond human hair wig in an undo hairstyle. Dress of fine silk-tulle with Habotei-silk lining, hand-dyed tulle-ruche border. 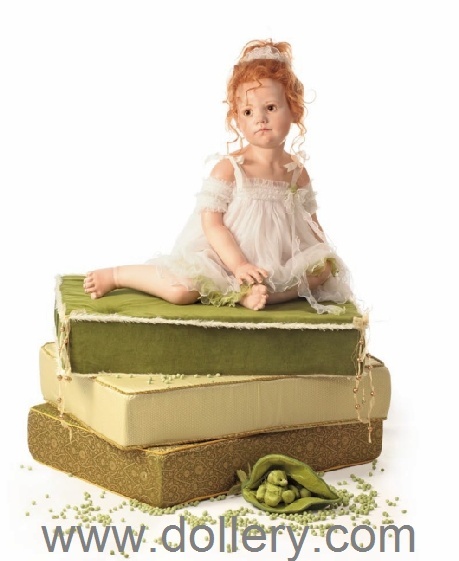 Habotai-silk underpants, Comes with Peapod with little silk bear by Annette Rauche and 3 foam cushions covered in cotton velvet and silk-brocade. 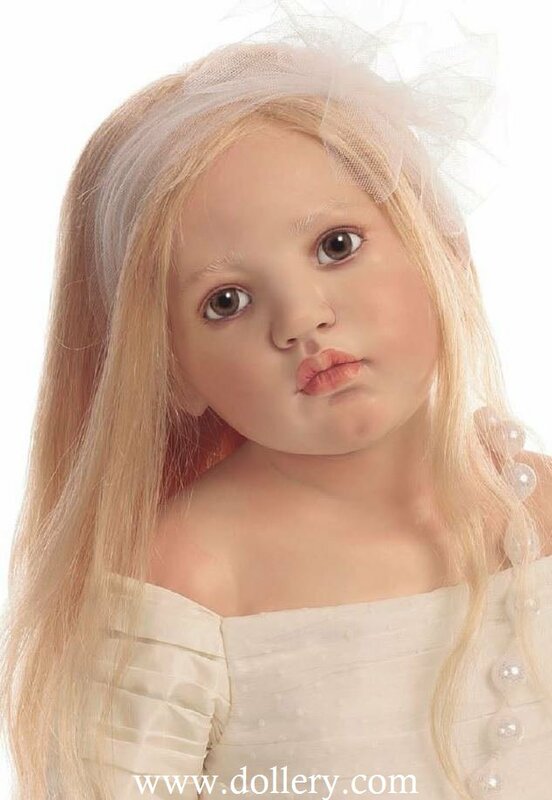 Doll is made of wax over porcelain. Mouth-blown blue glass eyes. 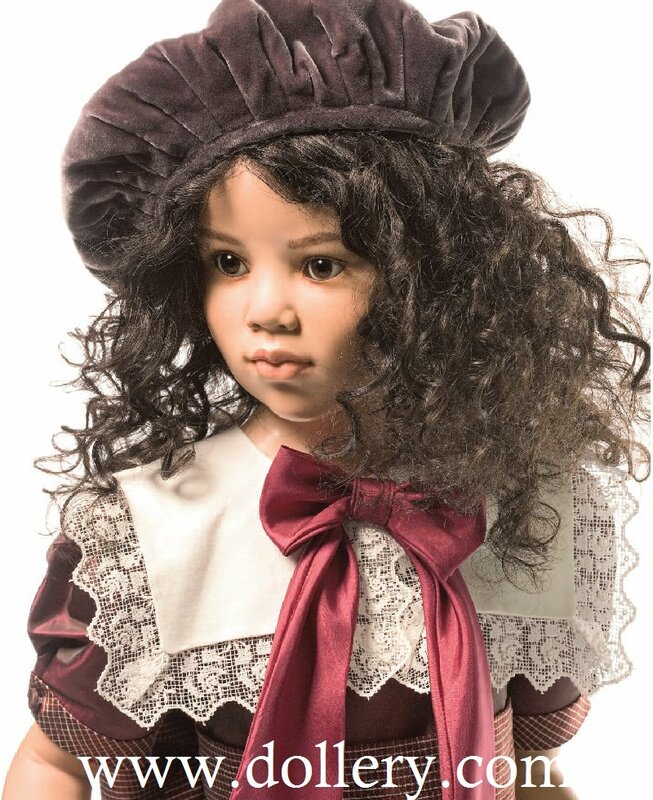 Hazel-brown human hair wig with curls and a big bow of silk-taffeta. Sumptuous dress according to an antique model, made of silk-taffettas, silk brocade and Honan-silk with collar with silk-tulles ruche. Cotton underpants with tulle laces. Underskirt made of Habotai-silk with tulle trimming. Leather half boots with little buttons. 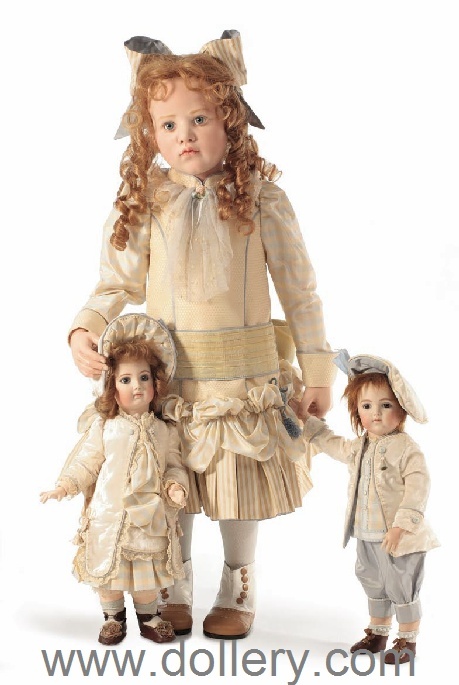 Comes with a 15.5" (40cm) reproduction "Jumeau" boy doll by Ute Mareczek and a 17.5" (45cm) reproduction "Brevete Bru" girl doll by Ute Mareczek. 2012 Update! Check out our Idex videos of each of Hildegard's wax/porcelain beauties below. We also have video coming on the resins! Be sure to refresh your screen if you jump from our video to something else on you tube by accident. We have many actual photos too we want to post soon - email kmalone@dollery.com with any questions. We are so excited about the line below! Gunzel pdf file -CLICK HERE! 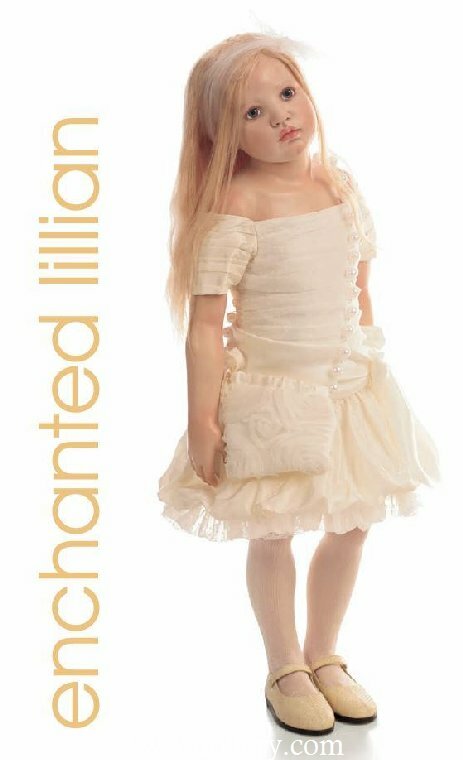 We just love "Rapunzel," she is an absolute winner! There are so many more.... take a peek! *Note, we noticed in our rush we mentioned Rotraut's name in the video by accident on occaision and obviously we are speaking of Hildegard! Sorry Hildegard! Both are masters in our eyes but these are clearly Hildegard's masterpieces! 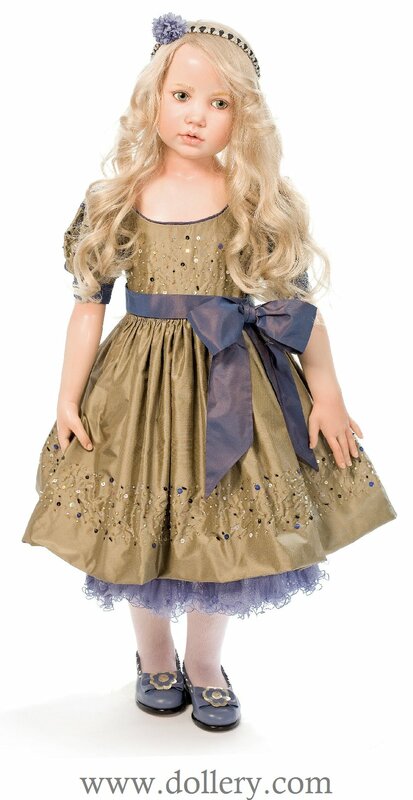 To order: Call 800-447-DOLL (3655) ext 22 out of state or 781-447-6677 in state Ma. You can also email kmalone@dollery.com. We are taking orders now with a deposit of 25% and the balance due when in. We can schedule your doll to come in subject to Hildegard's schedule at time of placing your order. If you are interested in acquiring a Gunzel but would like something a bit more affordable for you you should go to our Gunzel resin page to see her original designs done in small limited editions in resin in price points under $1,000.00. 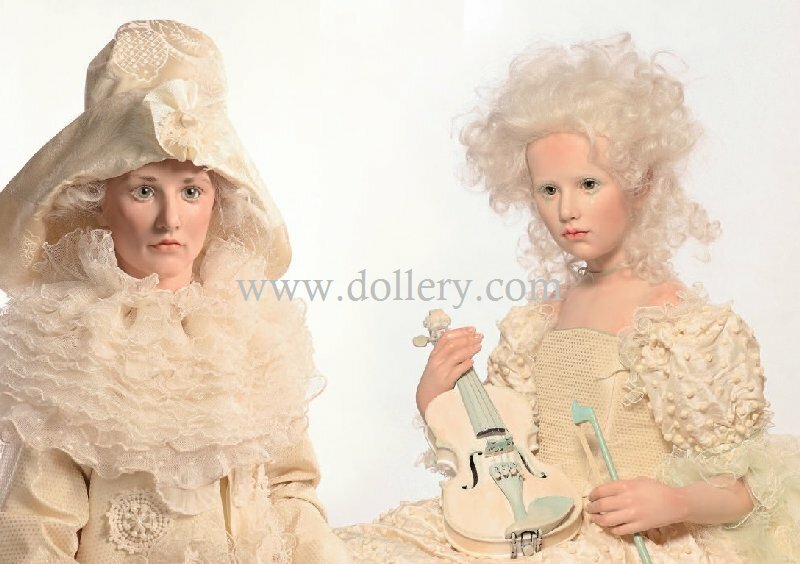 Go to : http://www.dollery.com/html/artists/gunzel/gunzel-mm.htm . We highly recommend these resins because they come directly from Hildegard and she does all the production control on them so the final products are exceptional. Hildegard also currently designs for GOTZ that mass produce her work in small editions in vinyl. 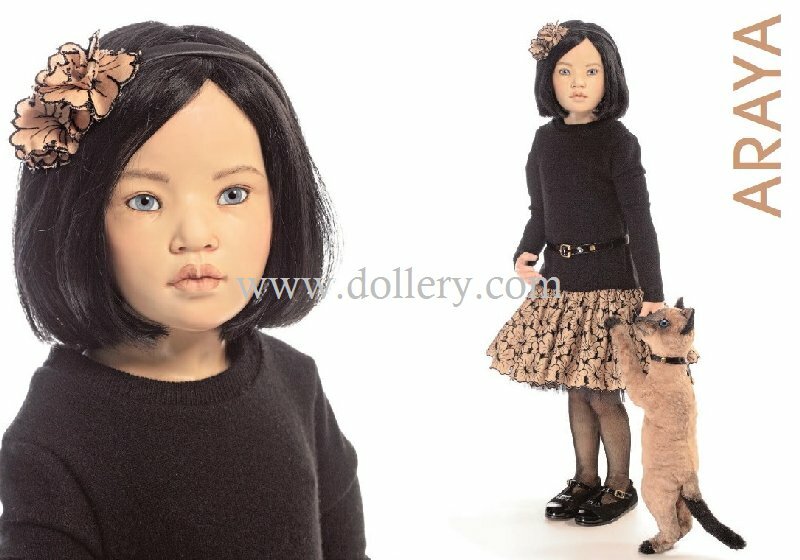 Go to: http://www.dollery.com/html/artists/Goetzvinyls/goetzvinyls.htm . We do not have the 2011 line up on these yet though. Be sure to note that not all Gotz dolls are designed by Gunzel so look for her name or I'm sure you will recognize them if you are a fan! 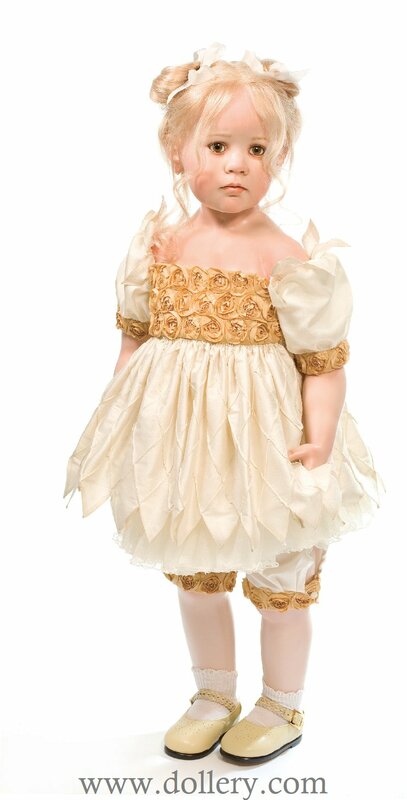 Rapunzel, $9,300.00 usd - DOLLERY FAVORITE! We are taking orders now - Contact kmalone@dollery.com. This one will sell out early. Reserve your order with deposit and we will work with you on layaway! LE/20, 39.5" (101cm) standing. Mouth-blown green glass eyes Blonde human hair wig with artistically arranged braids (that cannot be undone). Elaborately executed dress made of Ashoka and Bourette silk. Corsage top, laced in the back with silk tulle fringes. Fixed underskirt with silk tulle frills. Back of dress elaborately decorated with silk tulle flounces and fringes. Slippers made of Ashoka silk. 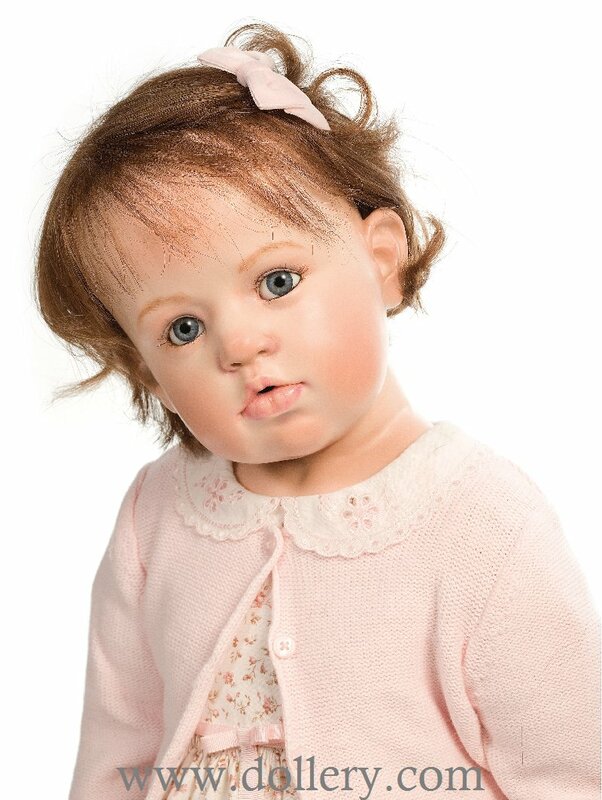 LE/20, 37.5" (96cm) standing, mouth-blown grey glass eyes.Brunette, long human hair wig. Dress with balloon skirt made of French silk taffeta and top made of silk velvet and silk tulle ruches. Knee length silk velvet trousers with tulle application. 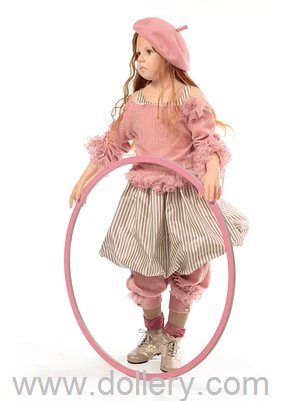 Beret, leather half boots, comes with a wooden hoop composed of 2 parts. LE/20 (as both Fleur Rose & Fleur Rouge), 34" (87cm) standing, Mouth-blown brown glass eyes. Blonde, slightly curled human hair wig. Hairband with velvet bow. Rose colored silk dress with siilk tulle over dress. Hand-knitted, delicate bolero wrap jacket. white leather shoes. 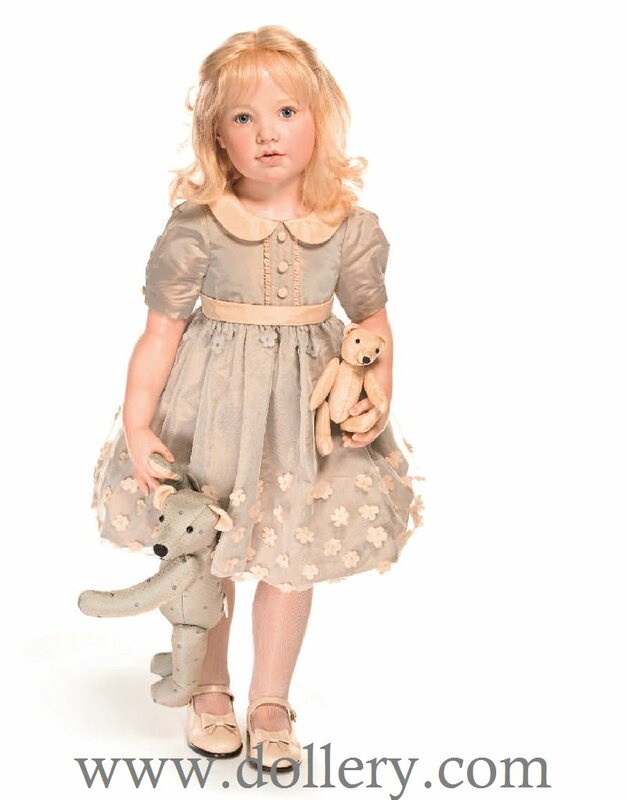 Accessory: silk mohair teddy bear, decorated with pearls. 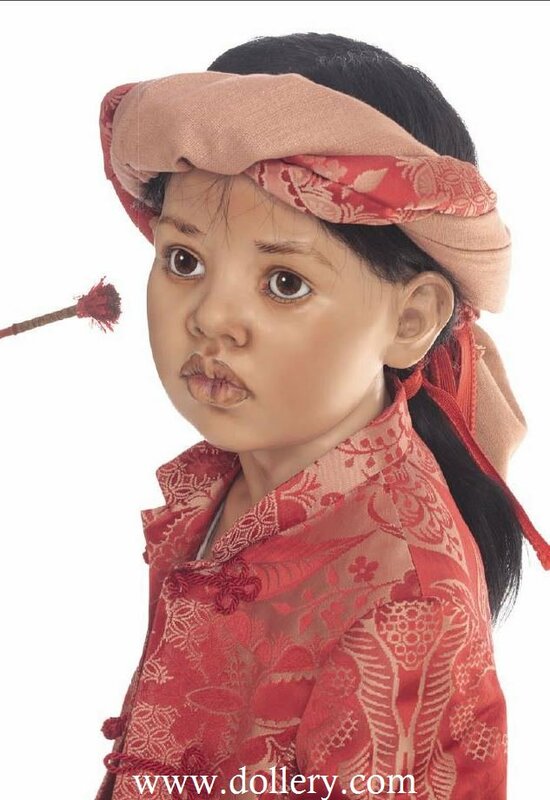 Fleur Rouge, $8,150.00 usd - Another Dollery favorite! LE/20 (as both Fleur Rose & Fleur Rouge), 34" (87cm) standing, Mouth-blown brown glass eyes. Dark, almost black human hair wig in pageboy-style. Red velvet beret. Black cotton velvet dress with sleeves made of fine silk tulle. Big collar made of red velvet flowers, decorated with pearls. Underskirt with fine silk tulle frills. Black leather shoes and red stockings. Accessory Bru Doll, reporduction design by Ute Mareczek. LE/4, 30.5" (73cm) sitting (from head to foot). Mouth-blown blue-grey glass eyes. Blond, long straight human hair wig. Black skirt made of precious suede leather. Jacket made of fine silk embroidered with flowers. Suede leather top. Underskirt with tulle frills. Black stockings. Leather half boots with woven pattern. Accessories by various artists, variations in composition by Hildegard Gunzel. On the occasion of her 40th anniversary, Hildegard has come up with this very special piece. 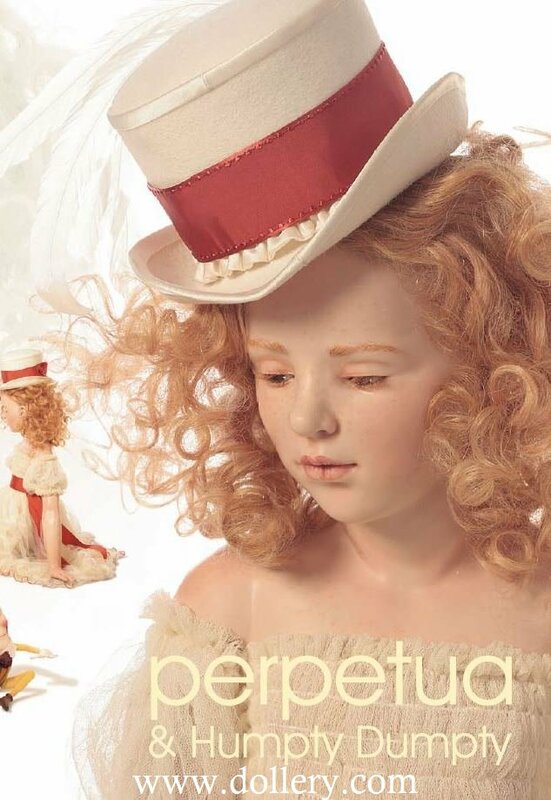 She is parting with some of her items from her magnificent doll collection; artist dolls from Kissling, Natterer, Periini, Esche, Deval, Himstedt, Yvonne Flipse, Sigikit, Kukinova and Steiff will be represented. Greta is a delicate and romantic girl. Her aunt entrusted her collection to her because she knows that Greta loves these dolls and will surely give honor to them. Greta, deeply touched by her aunt's letter, is pressing it to her heart. 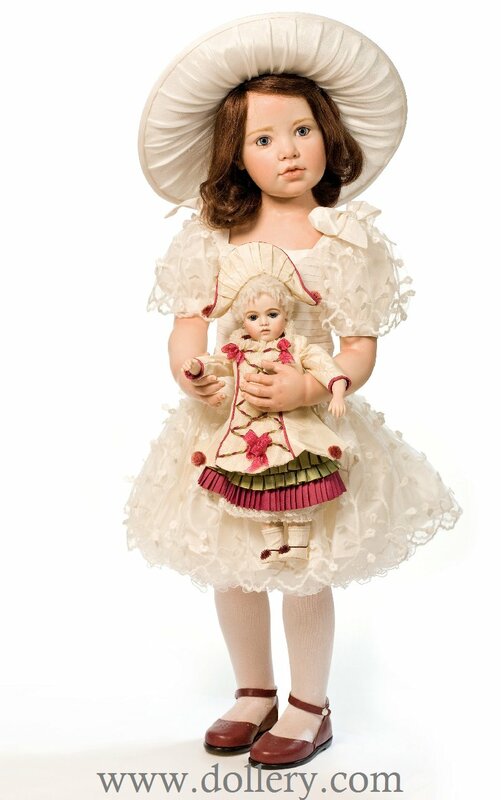 With her other hand she is holding a little porcelain doll by Jane Davis. Each Geta in this edition will come with a different accompaniment which I will choose in my discretion. 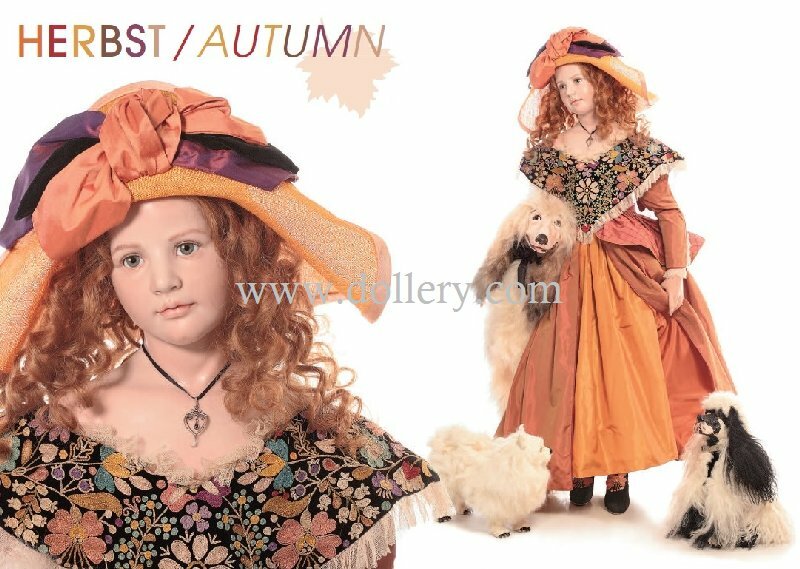 Buth there will always be a doll by Jane Davies, an antique reproduction by Ute Mareczek and - as in every good contemporary collection - also a Hildegard Gunzel doll will be included. LE/20, 32" (81cm) standing. Mouth blown light brown glass eyes. Red-brown human hair wig. Ensemble consisting of ruched silk trousers with silk tulle fringes. jacket with collar made of silk tulle fringes. Top made of embroidered silk with pearls. Lower part made of panne velvet withtulle ruches. Harlequin-style leather shoes with little bells. Pointed hat made of panne velvet. Accessory: Unicorn decorated with string of pearls. by Christine Green. LE/20, 36.5" (93cm) standing. Mouth-blown brown glass eyes. Long, dark brown human hair wig. Headdress of golden silk organza after an antique model, decorated with precious Bouillon embroidery. Golden blouse woven from fine metal threads with a collar in Bouillon embroidery after an antique model, with golden metal plates and pearls. Gold-coloured silk skirt with delicate flower embroidery. Front exclusively designed with inserted part made of folded, multi-colored silk-taffeta. Belt and bracelets also in Bouillon embroidery after antique model, with golden flower plates and pearls. Bracelets with golden bells. LE/10, 41" (105cm) standing. Mouth-blown light brown glass eyes. Wavy strawberry blond human hair wig. Variable versions of hair decoration. Yellow-golden silk dress in dirndl-style, embroidered with flowers. Cotton corsage. Green silk taffeta apron with chequered taffeta bow. 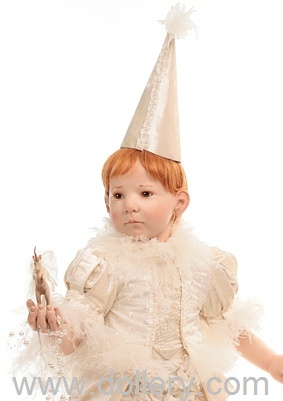 (see other image below) Titania, $8,150.00 usd LE/10, 32" (82cm) standing. Mouth-blown green grey glass eyes. Blonde human hair wig. Silk-velvet hair bow. Blue/black/gold striped silk taffeta dress. Silk-velvet belt with bow. Underskirt decorated with hand-dyed tulle frills. Black patent-leather half boots. 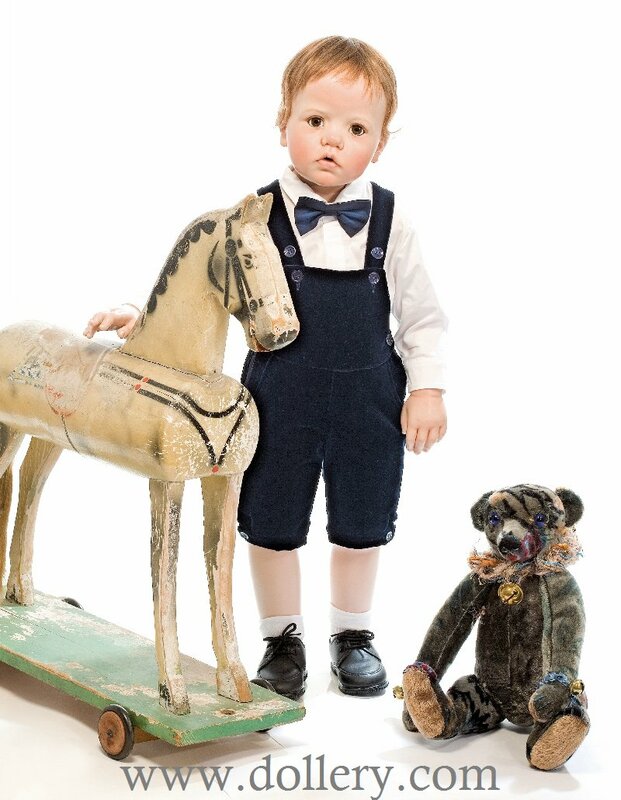 Accessory Teddy bear made of antique silk-velvet (different styles) by Isolde von Malchus. 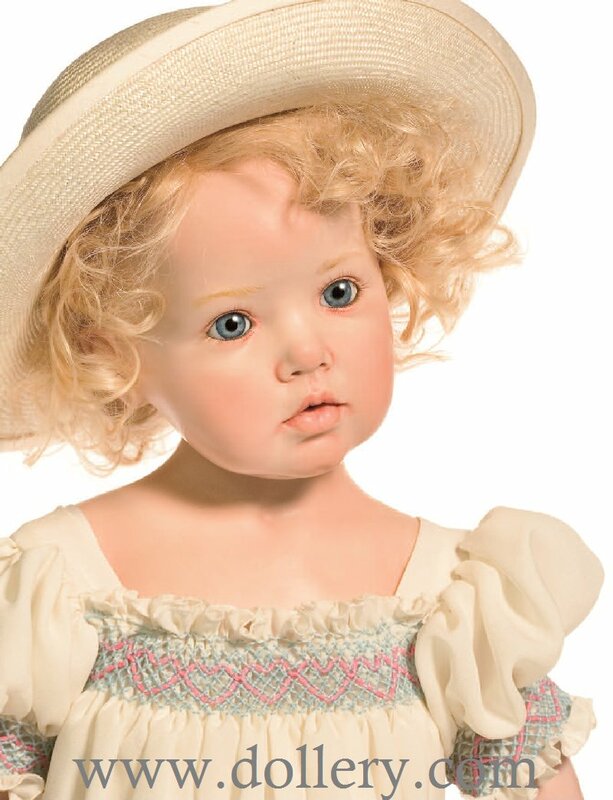 Claire, $8,150.00 usd LE/10 33" (85cm) standing. Mouth-blown grey-green glass eyes. Curled brown human hair wig with taffeta bows. Burgundy/gold striped silk taffeta dress. Top with taffeta ribbon roses. Knee-length trousers made of taffeta rose fabric. Black half boots. Accessory: Teddy bear made of antique silk-velvet (different styles) by Isolde von Malchus.